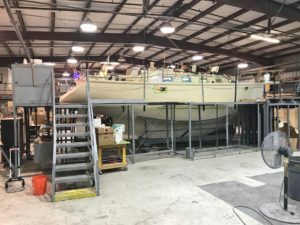 In continuing with the newly formed partnership between Island Packet Yachts and K2 Marine Systems, we completed another brand new IP349 which is now ready for cruising and anything mother nature has to throw at her! 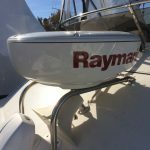 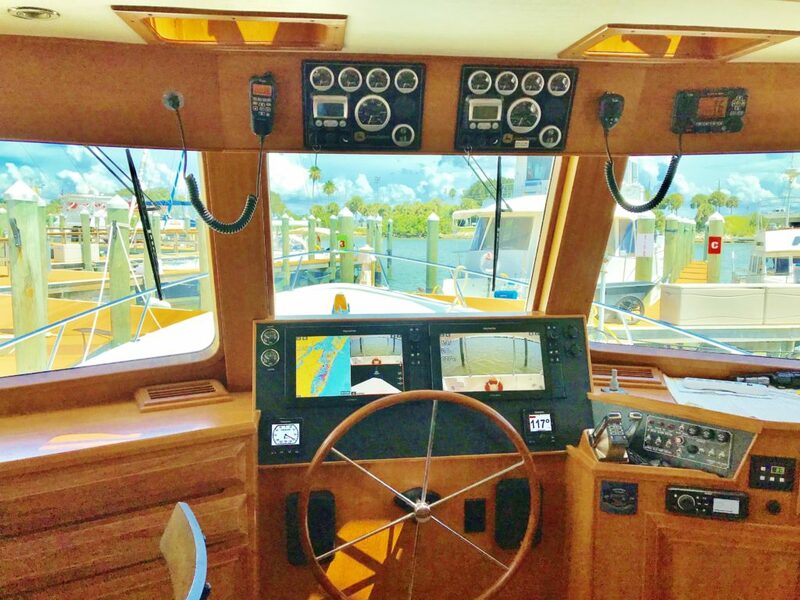 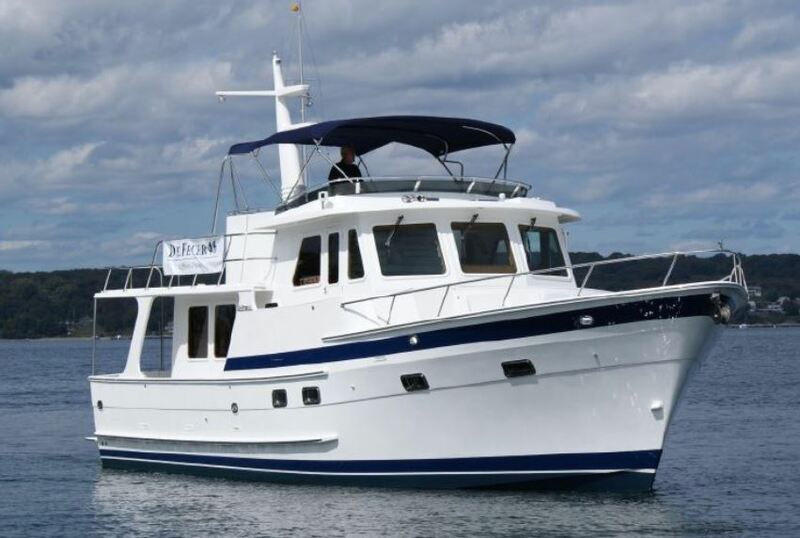 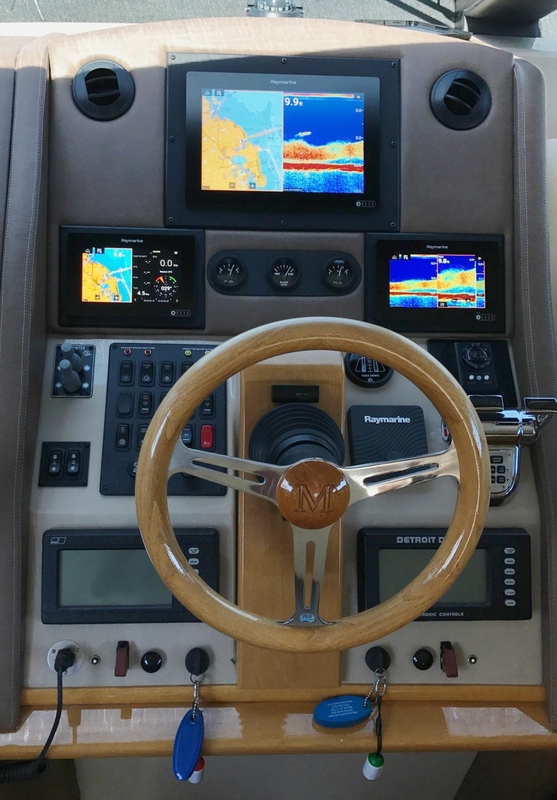 Loaded with the latest Raymarine Electronics Package including Doppler Radar, Class B AIS, 12″ Touchscreen MFD, Instruments, Autopilot, VHF and lots of extras, this boat is ready for many years of safe and fun adventure for her new owners. 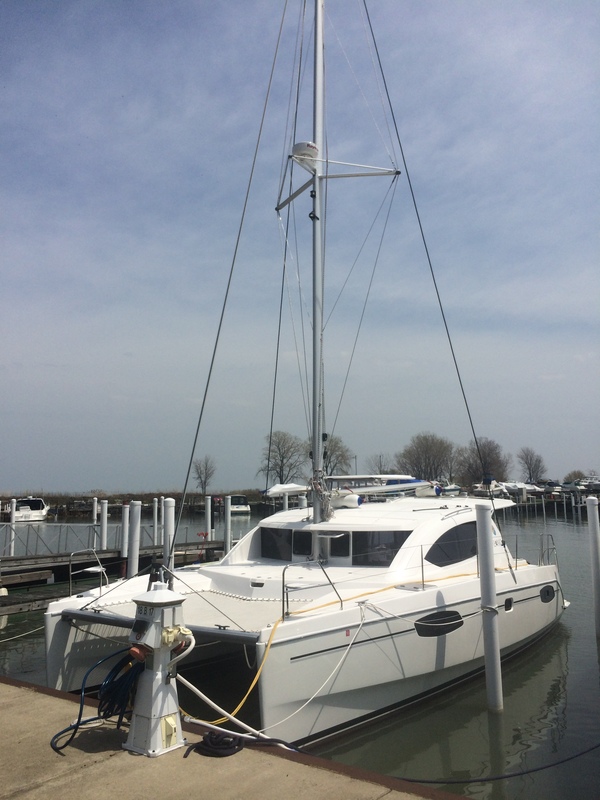 This new DeFever came from the factory with NO electronics or entertainment system. 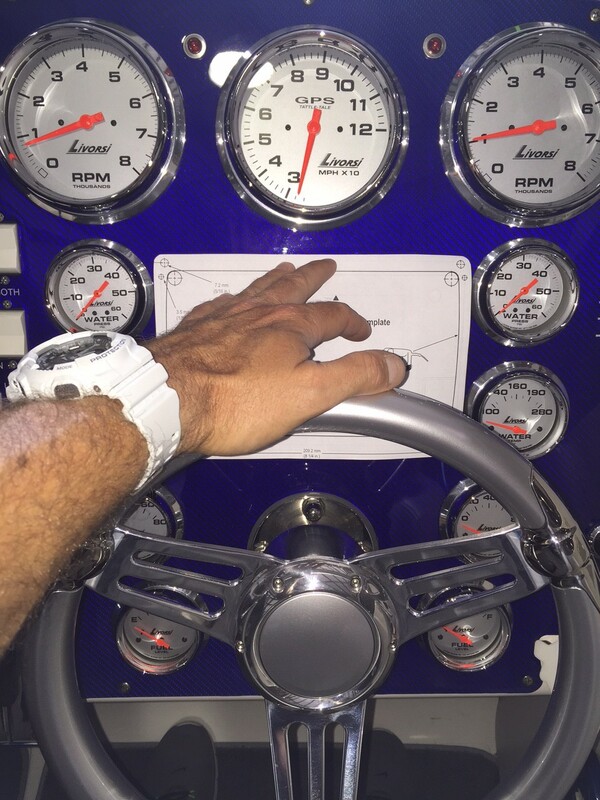 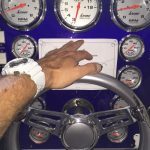 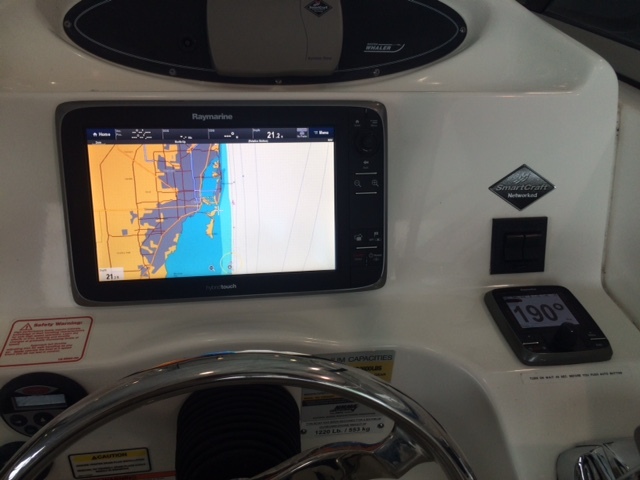 Enter K2 Marine Systems! 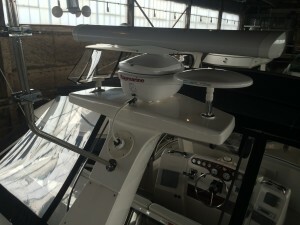 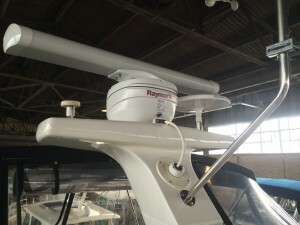 We installed three 16″ Raymarine AxiomPRO MFD’s, two VHF’s, Dual Station Autopilot, AIS, SiriusXM Sat Radio and Weather, Instruments, two TV’s with a KVH DISH Network Satellite dome and receiver, new Fusion Marine Networked Stereo/DVD and 12 speakers throughout as well as an entire array of networking components, Amplifiers, WiFi & Cellular Boosters and all the latest safety equipment. 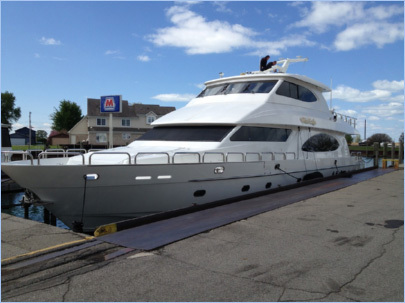 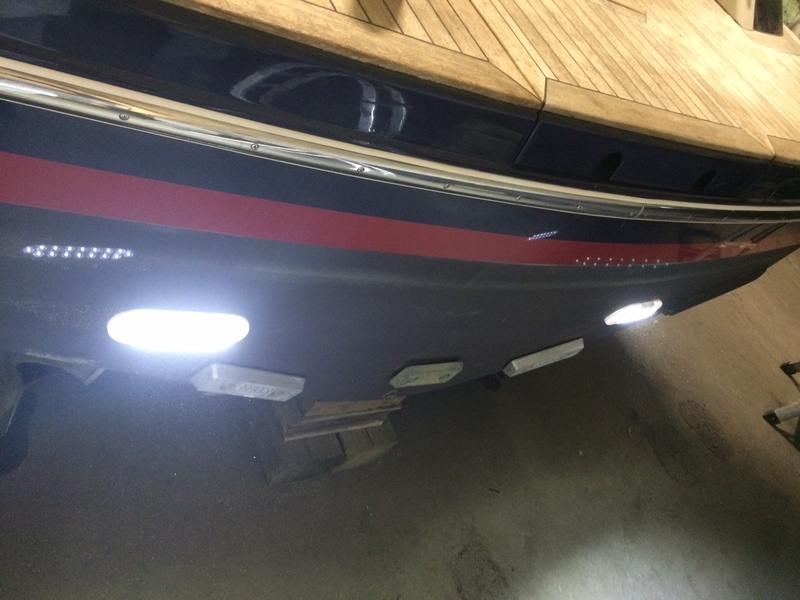 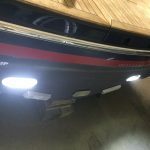 This beautiful 2007 Marquis 59′ was ready for a 10 year electronics upgrade when the new owner purchased her this spring. 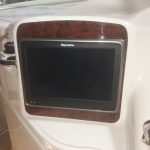 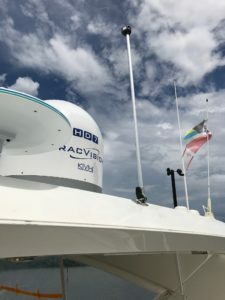 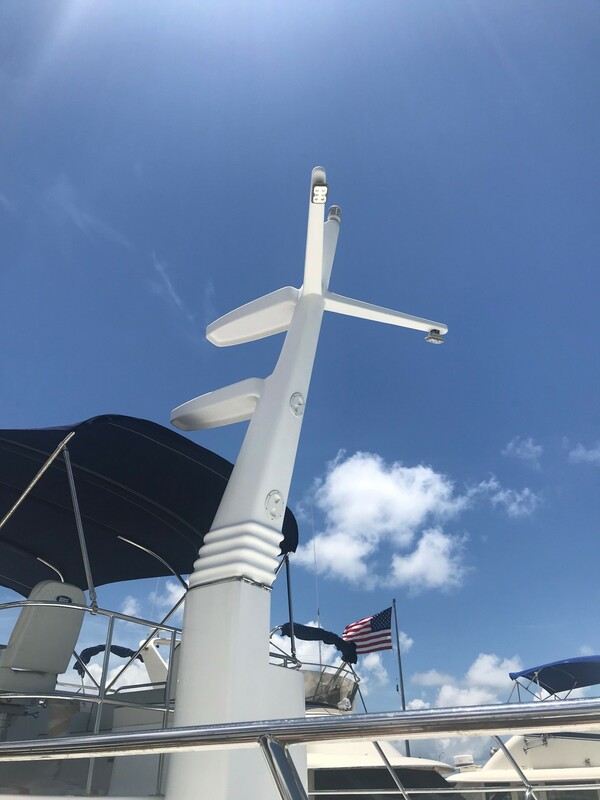 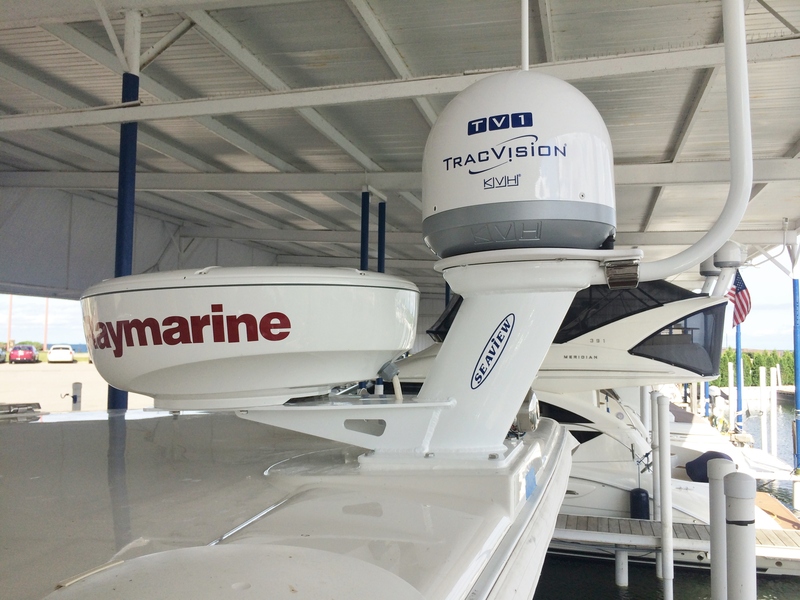 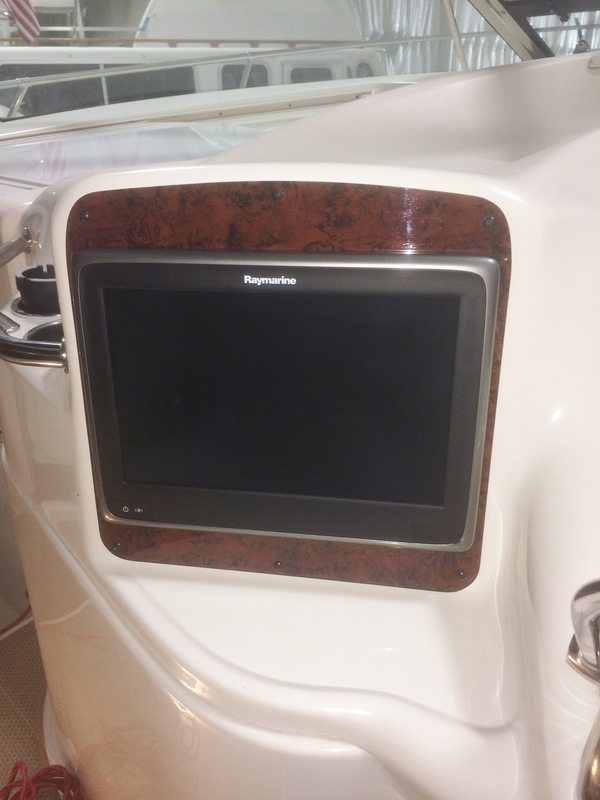 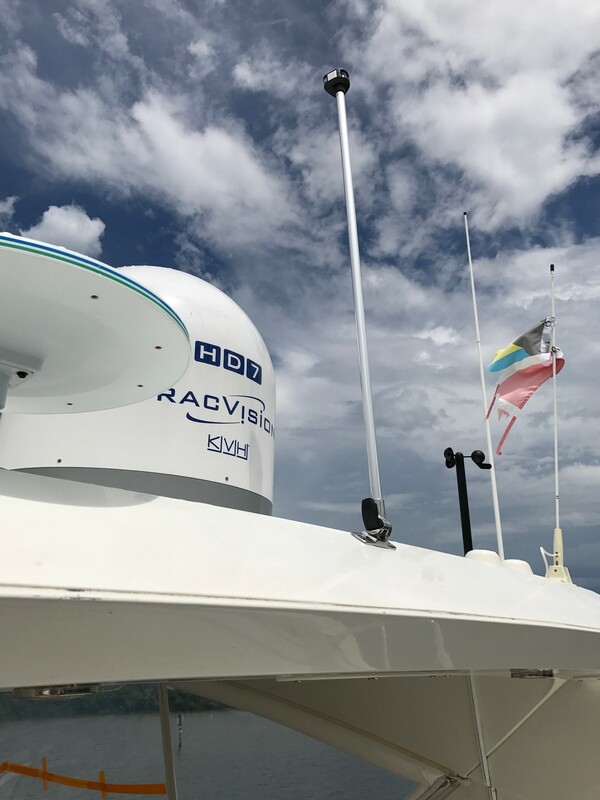 We installed a complete electronics package with everything from the DirecTV System, Stereos, Autopilot, Radar, VHF’s, Satellite Weather and SiriusXM Music, Cameras to six ALL NEW Raymarine AXIOM displays with their latest Realvision 3D Sonar as well as a huge list of extras. 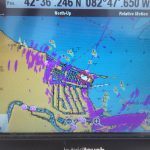 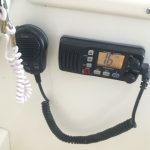 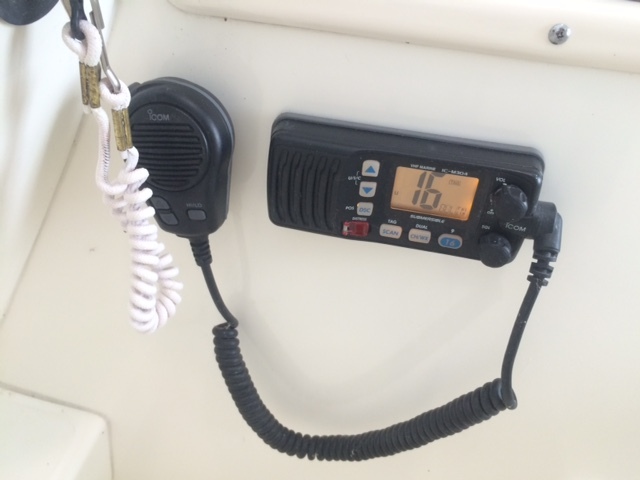 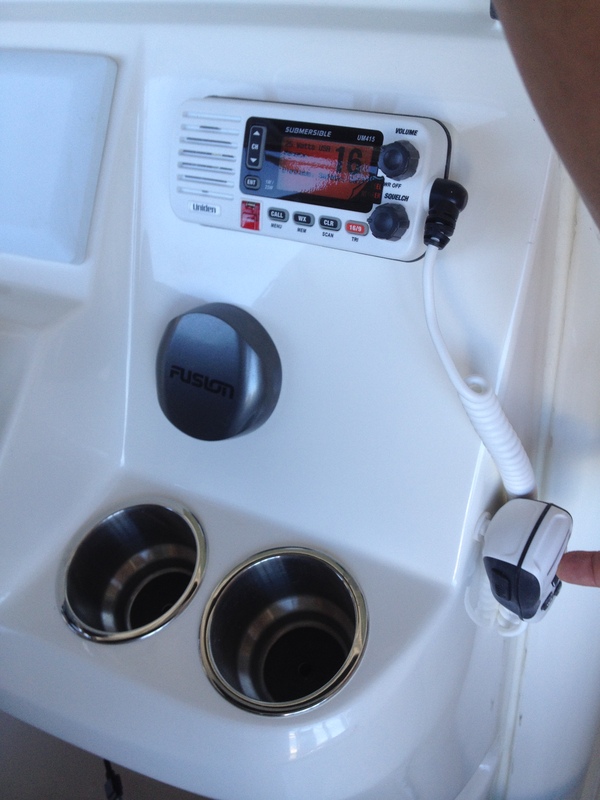 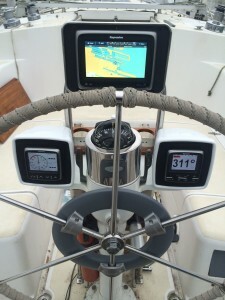 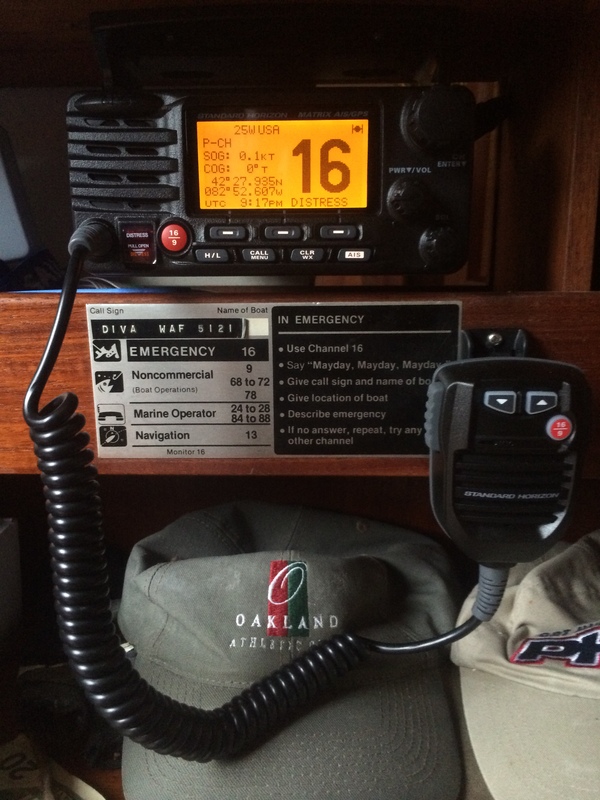 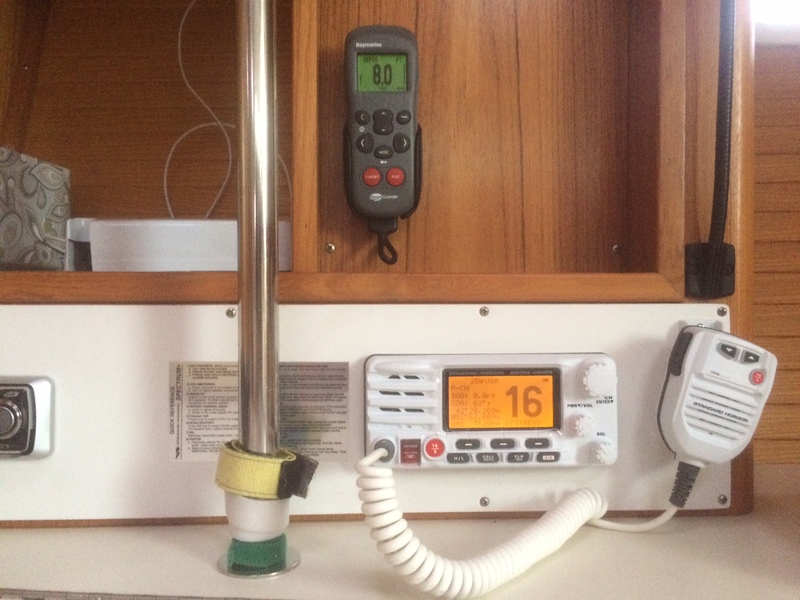 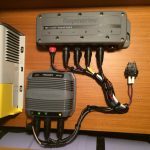 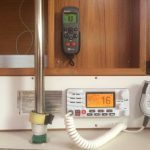 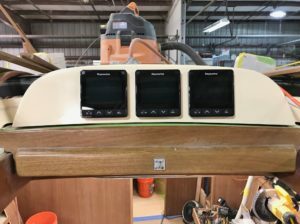 As this Hatteras passed its 10 year mark, it was time to get up to date with some new electronics. 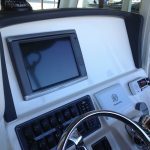 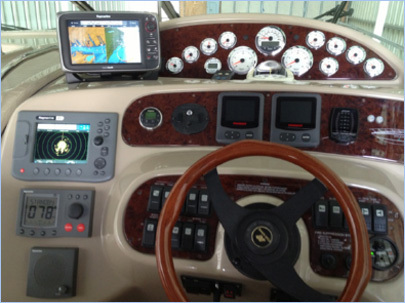 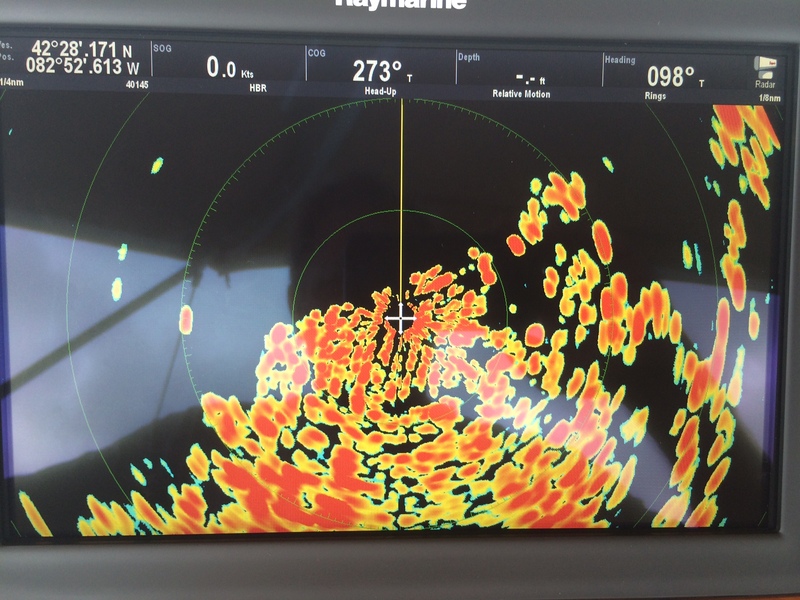 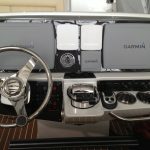 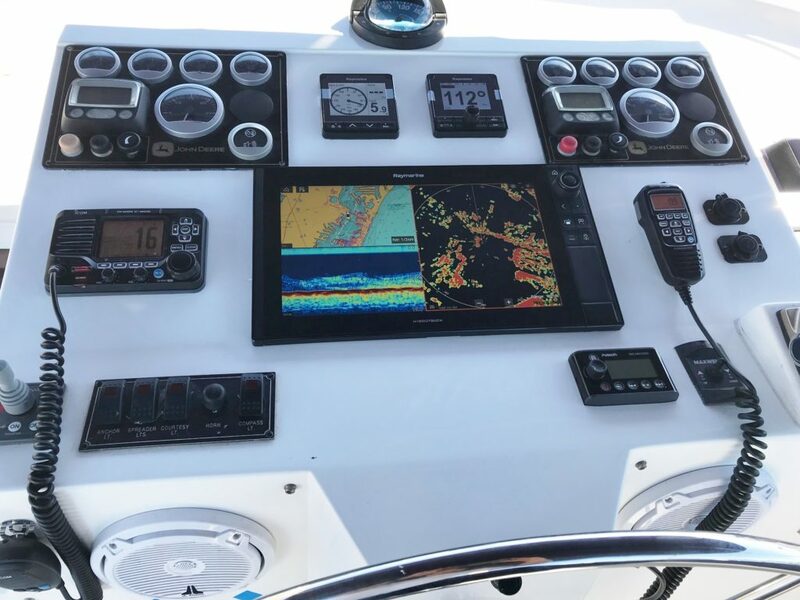 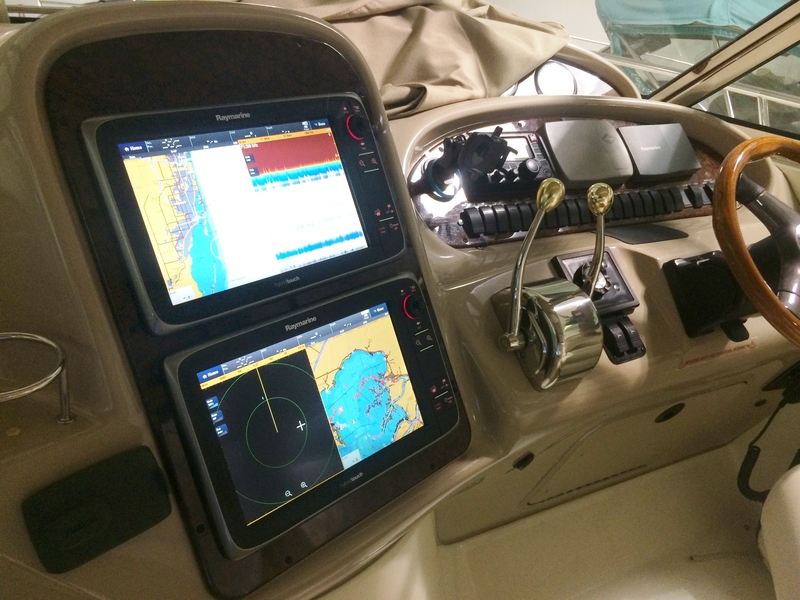 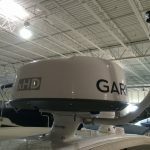 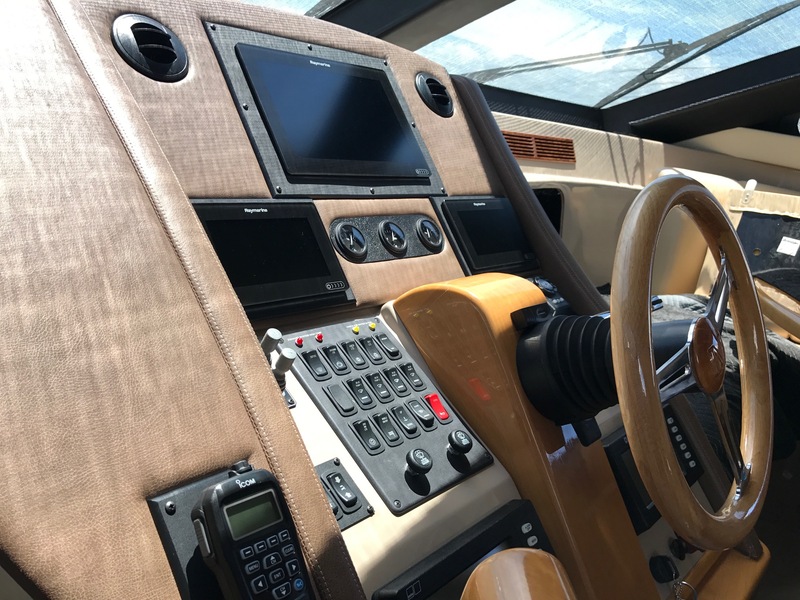 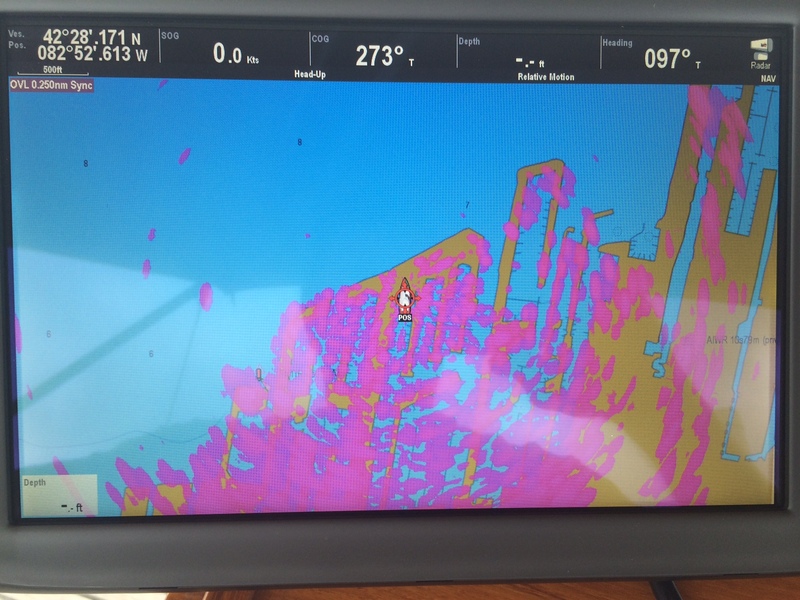 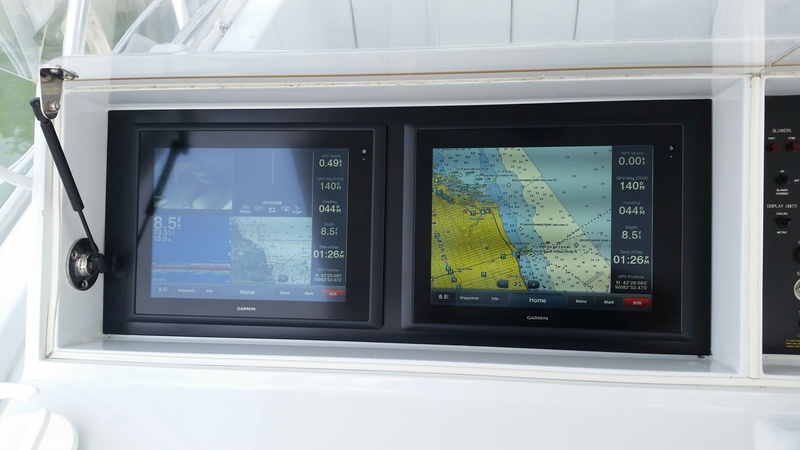 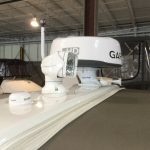 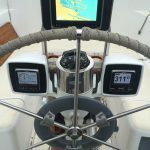 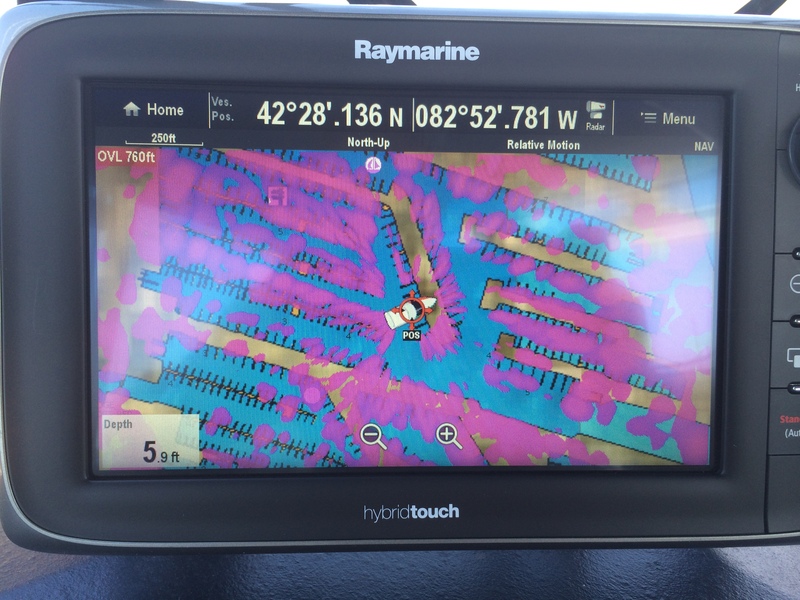 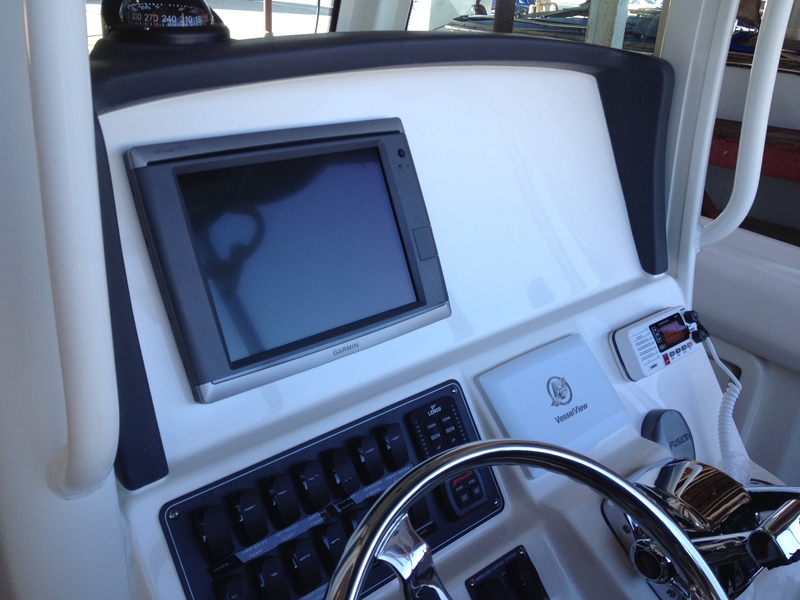 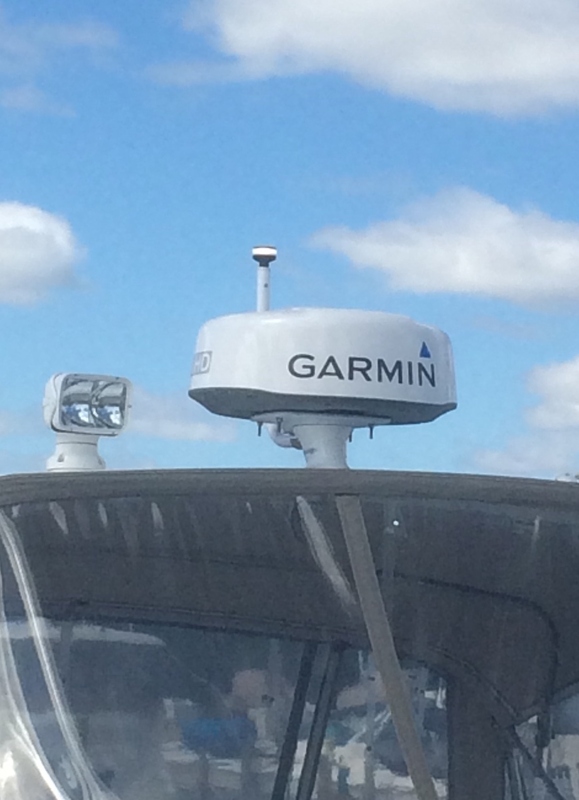 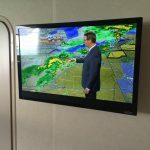 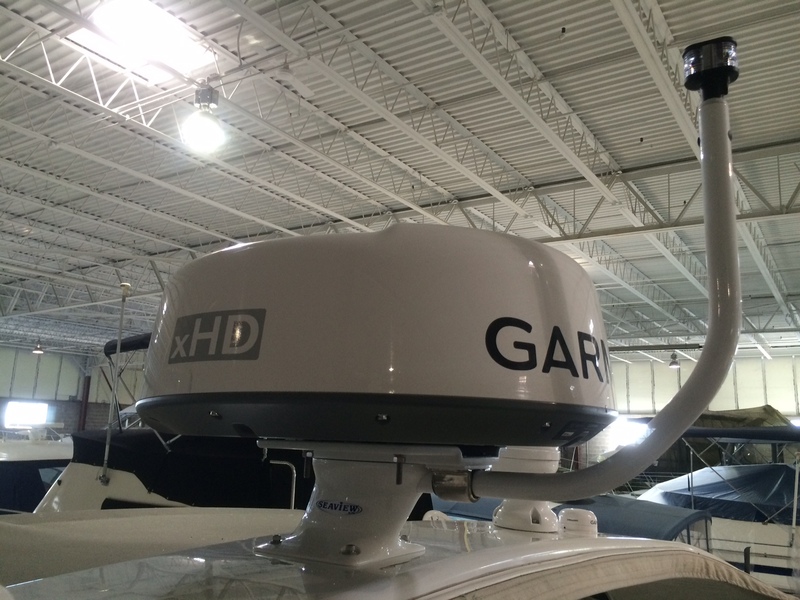 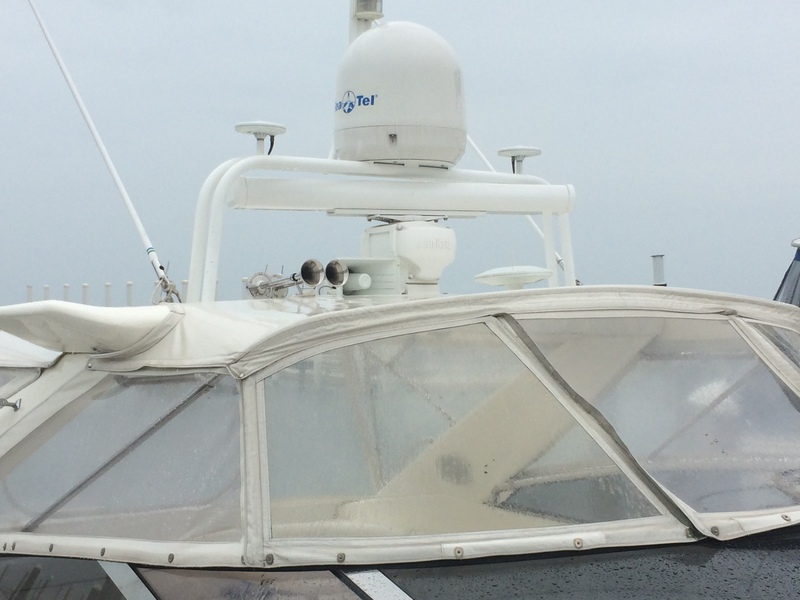 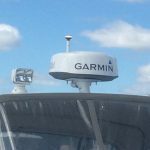 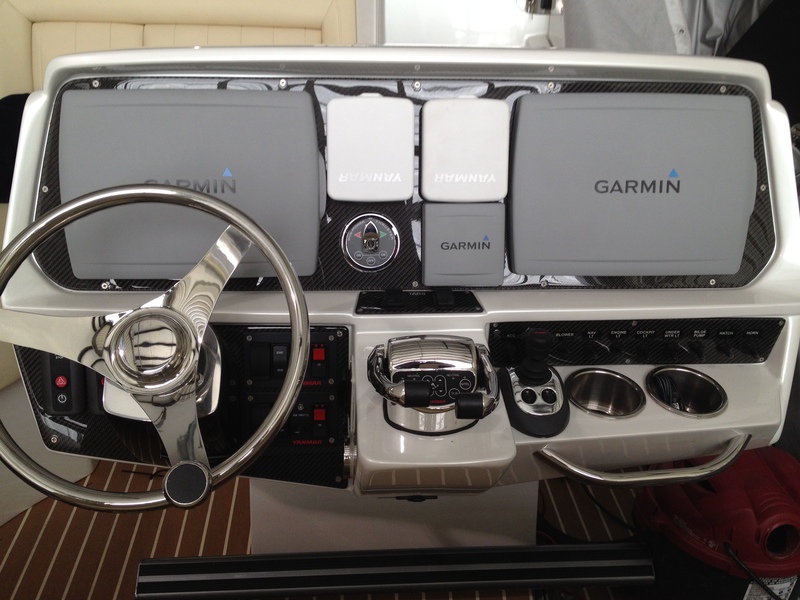 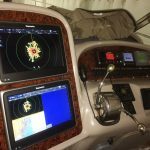 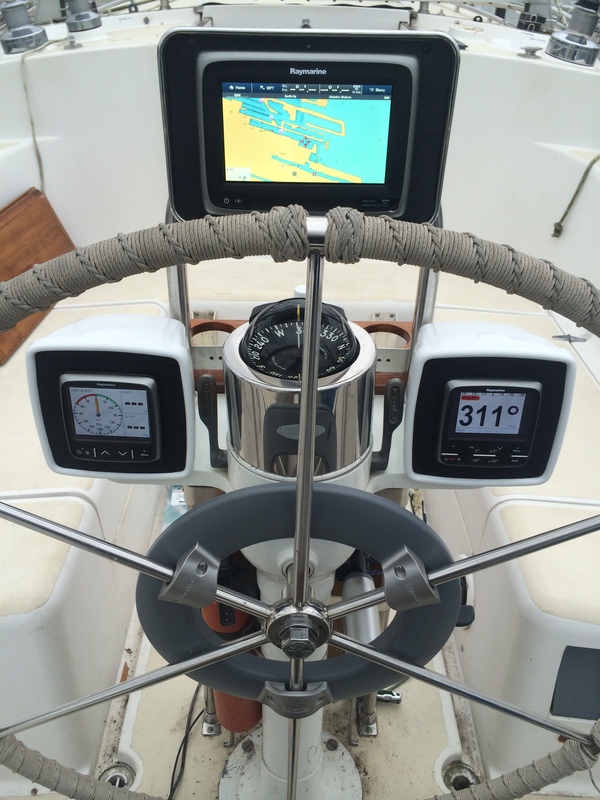 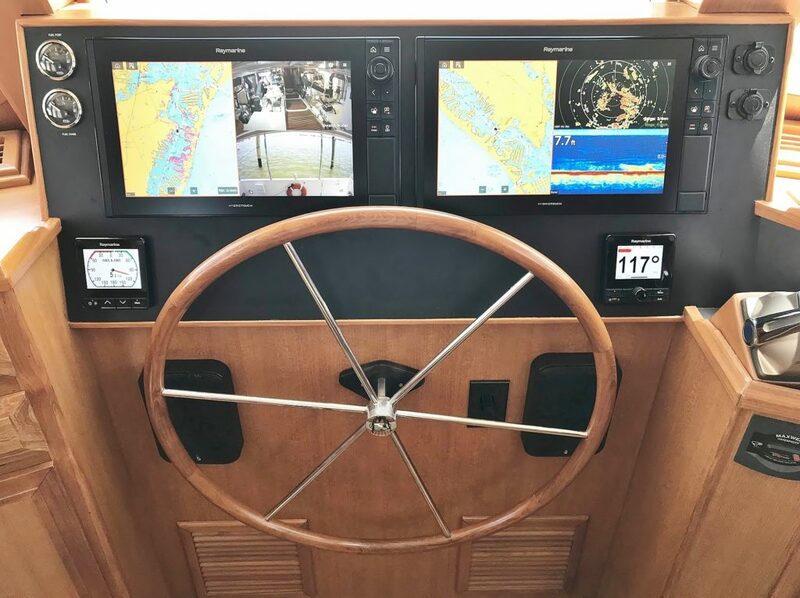 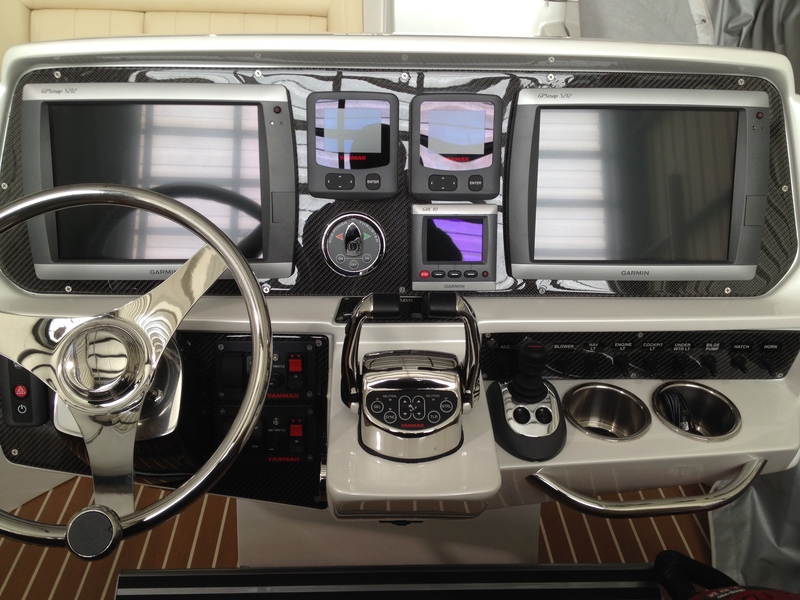 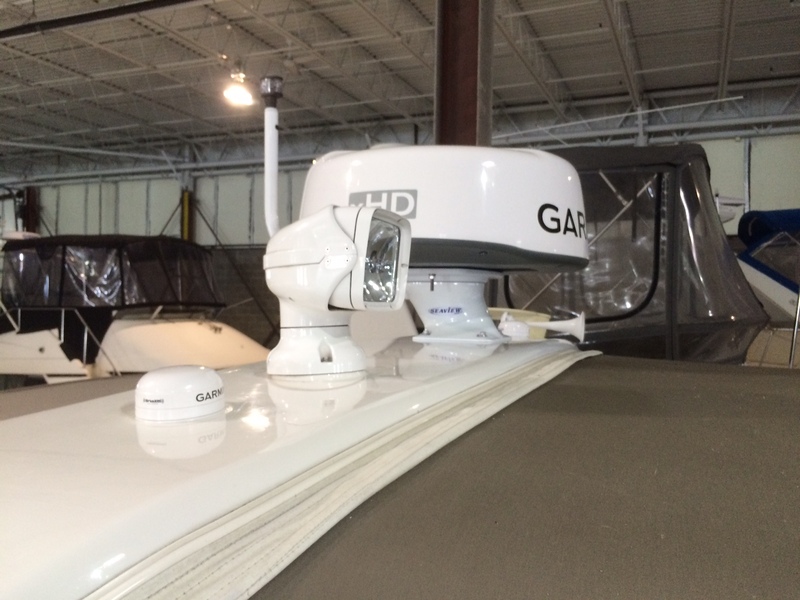 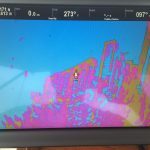 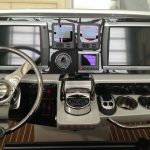 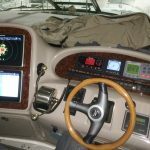 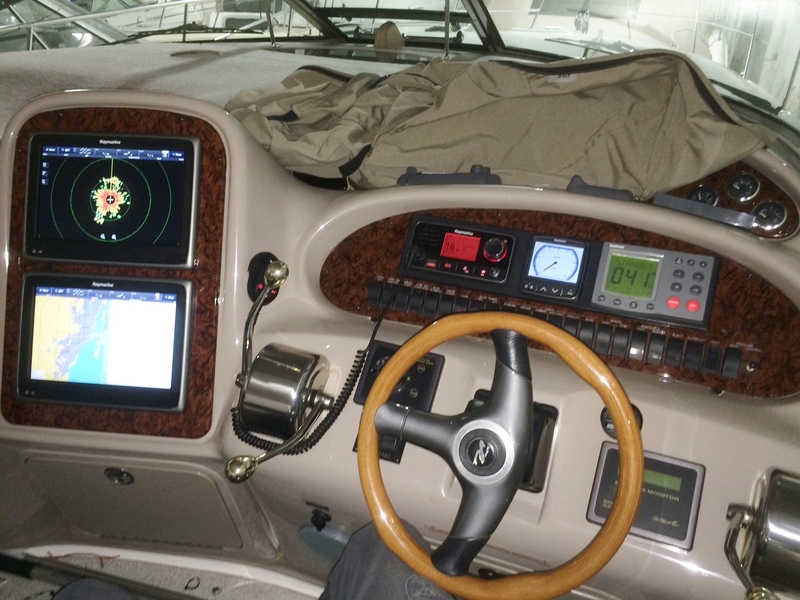 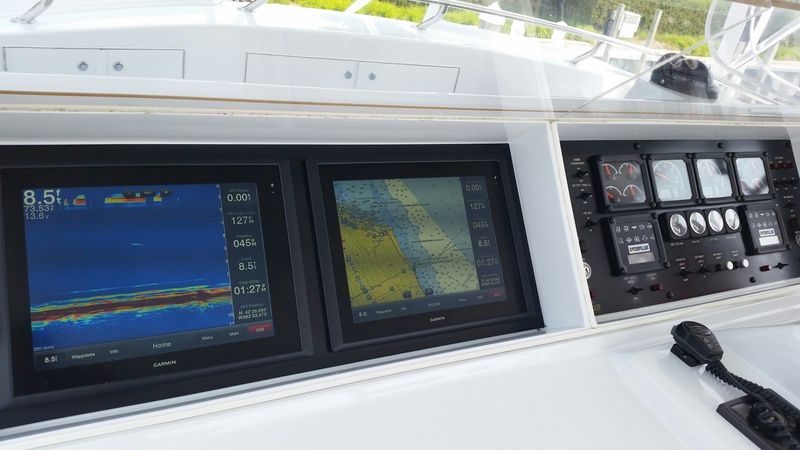 We installed 3 Garmin 8000 Series Touchscreen Multidisplays (two 15″ and one 8″), a new 6′ Open Array 12KW Radar, new Sonar with B260 1000Watt Transducer, two cameras, XM Weather/Music, new GPS, Wifi System, a remote and many other extras. 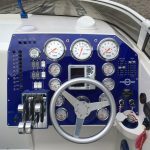 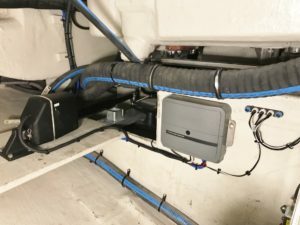 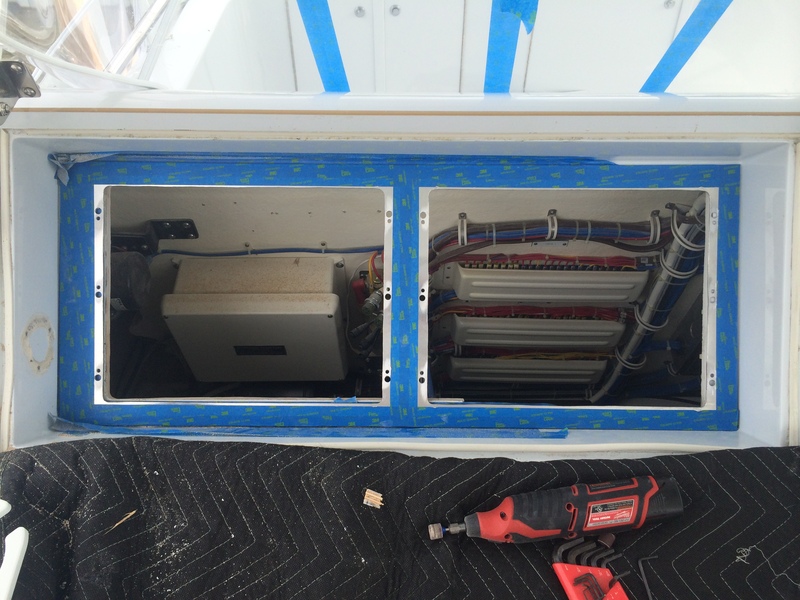 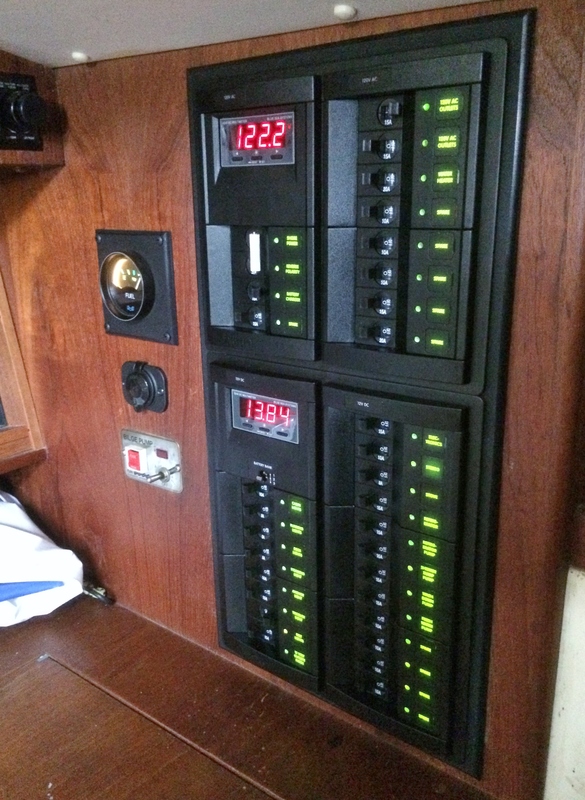 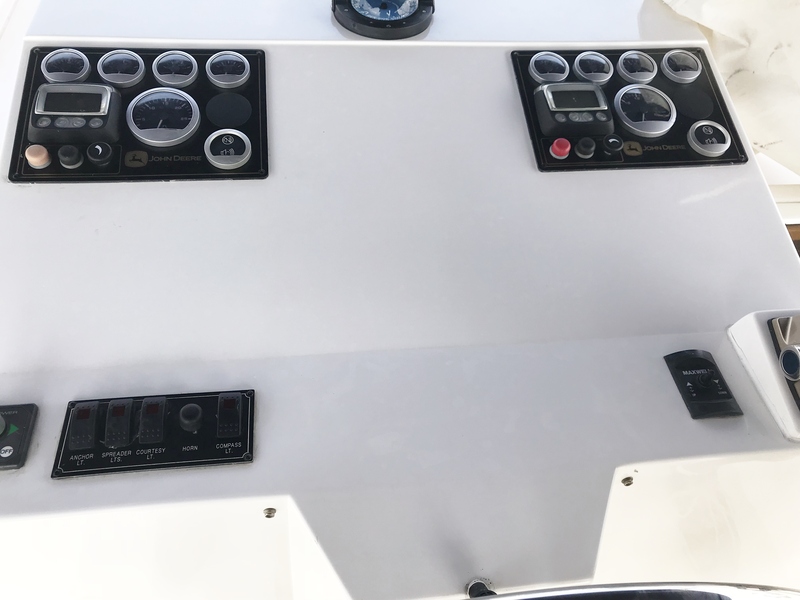 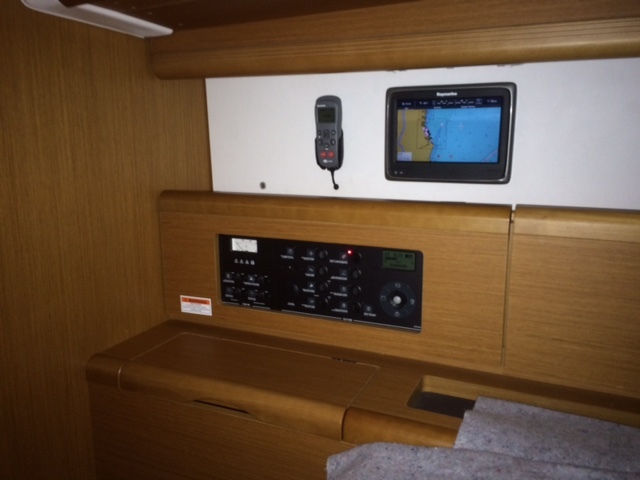 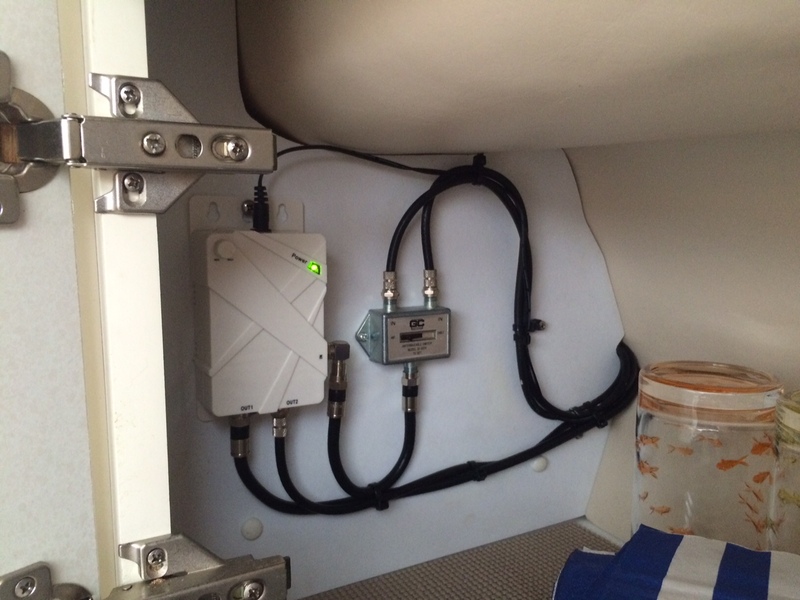 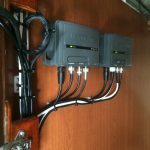 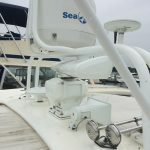 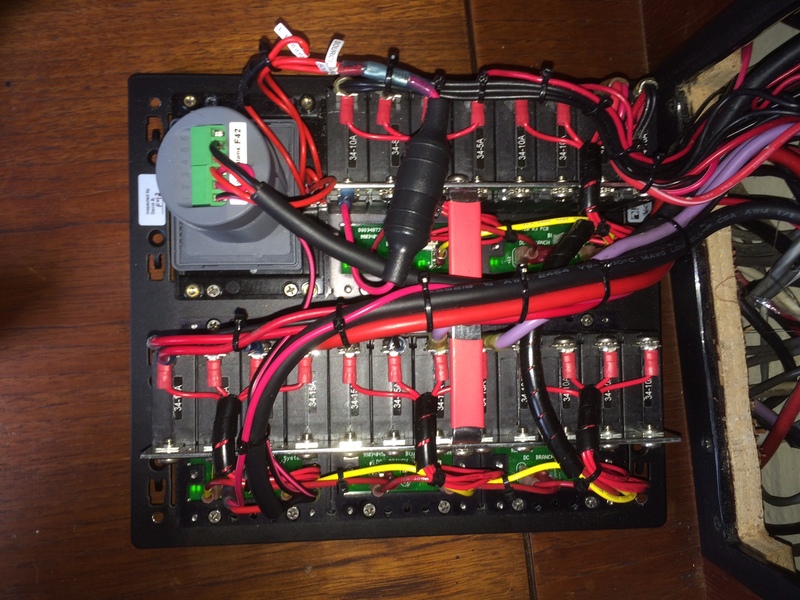 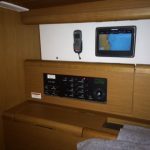 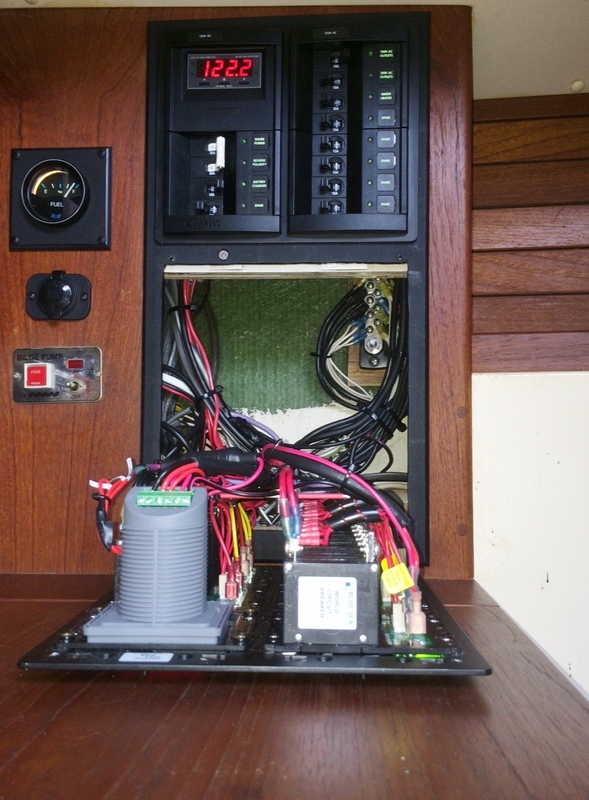 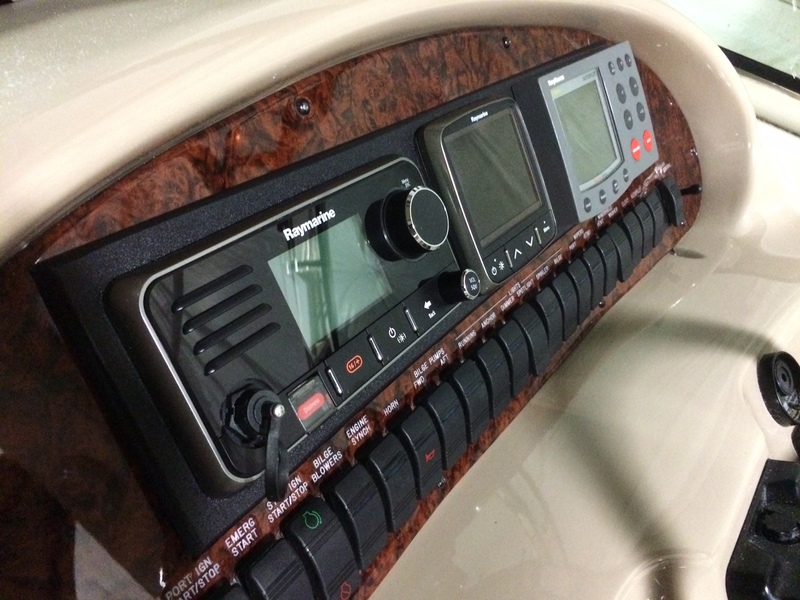 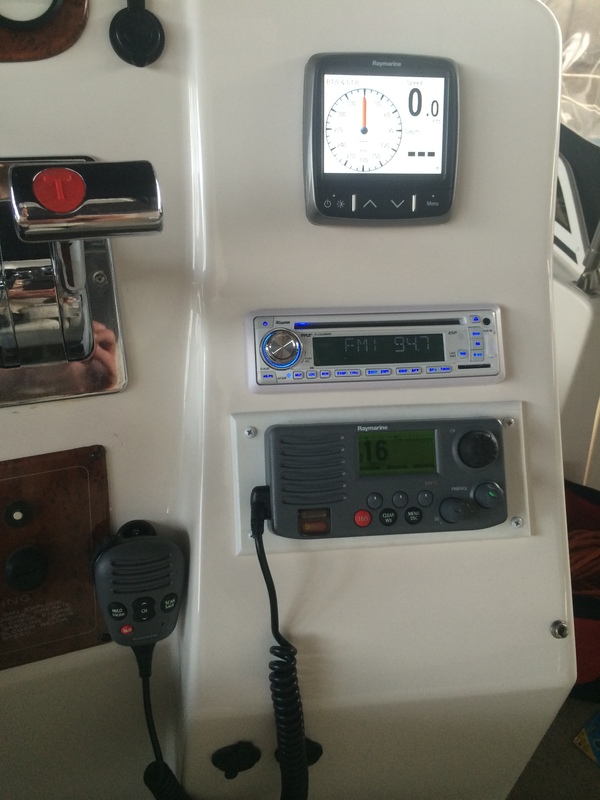 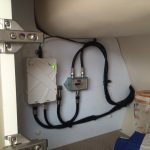 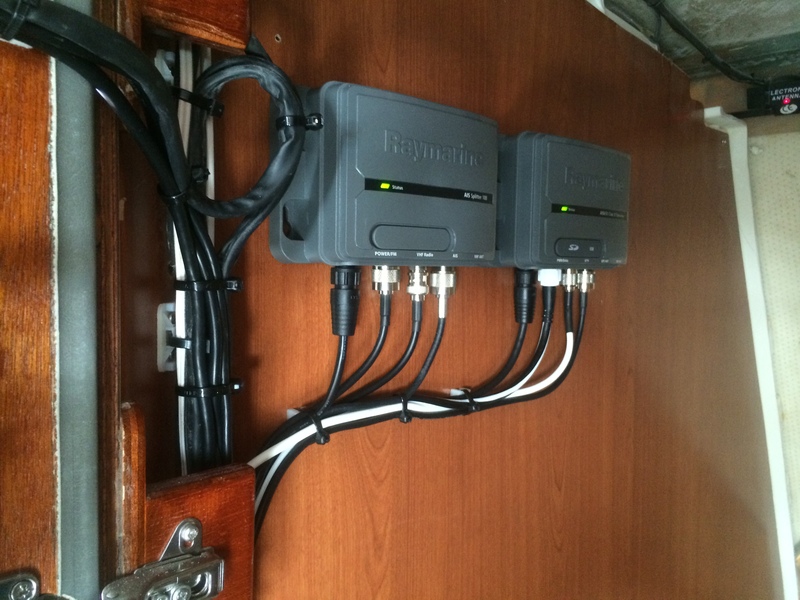 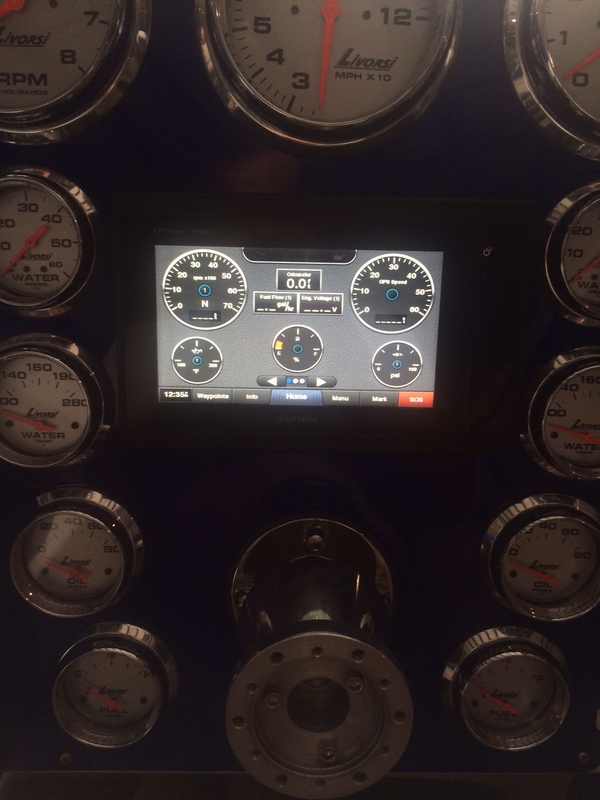 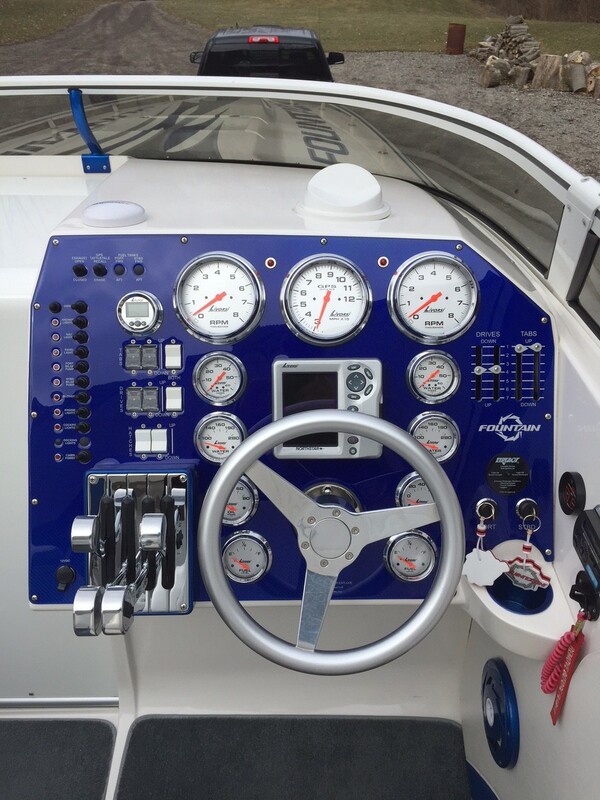 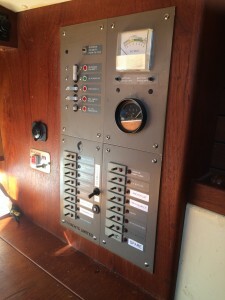 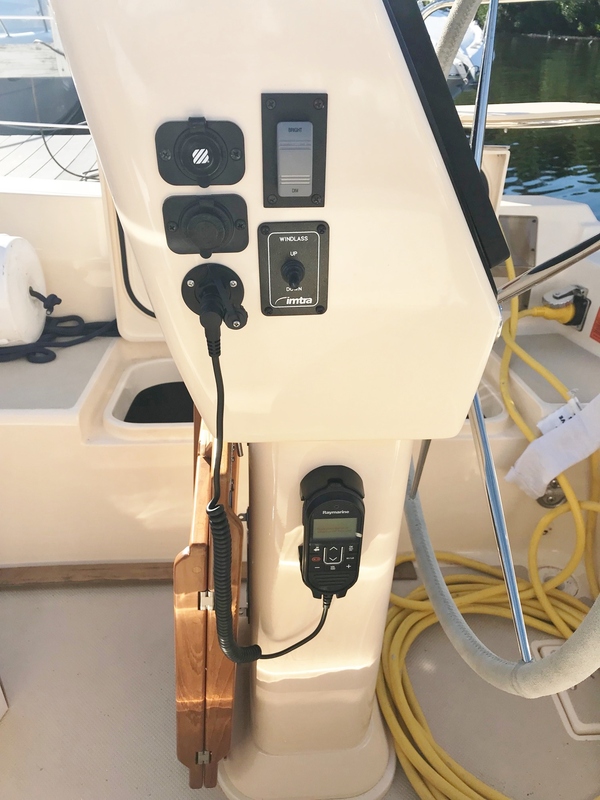 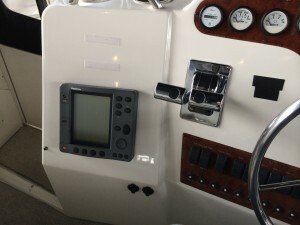 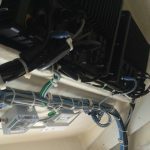 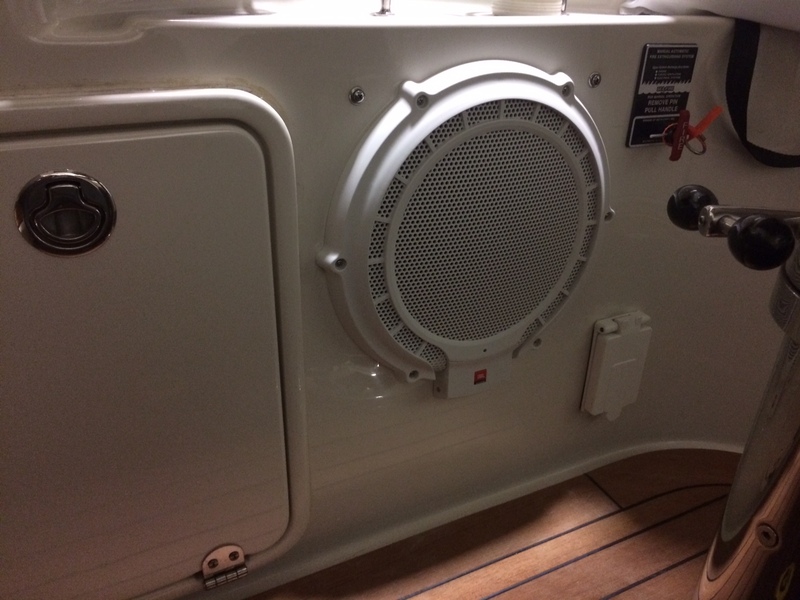 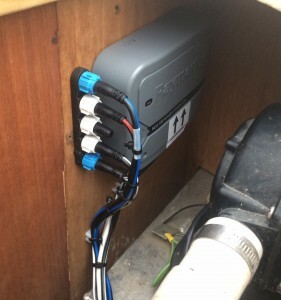 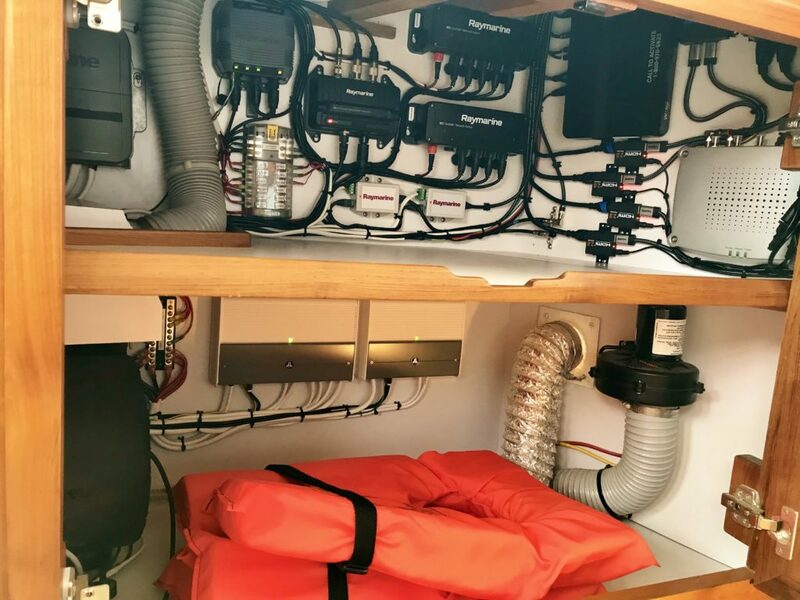 In addition to all new electronics (GPS Plotter, Autopilot, VHF Radio, Sailing Instruments, new Mast Wiring and new Helm Pods), this customer decided it was time to upgrade his electrical circuit panel with an all new Blue Seas 360 Modular Panel. 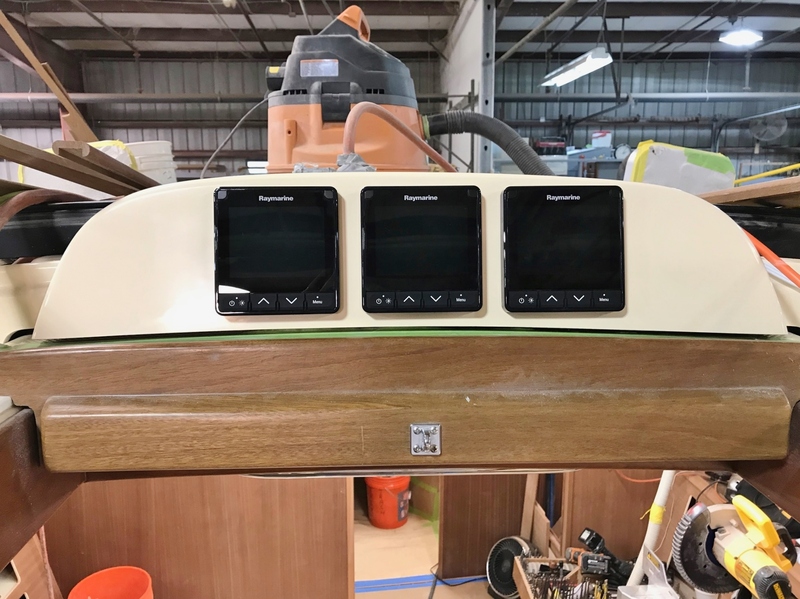 We designed, assembled and installed the new system with all new wiring, a custom bezel in addition to a larger cutout and teak reinforcement cross members. 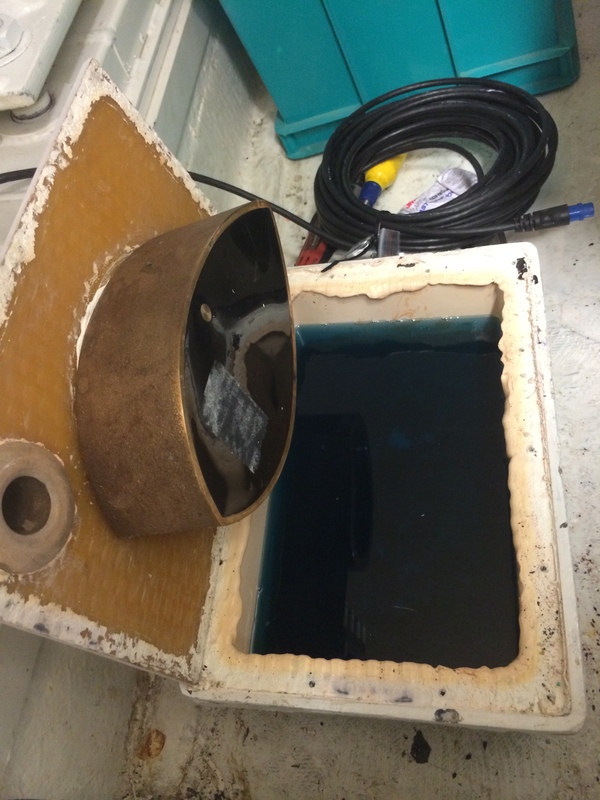 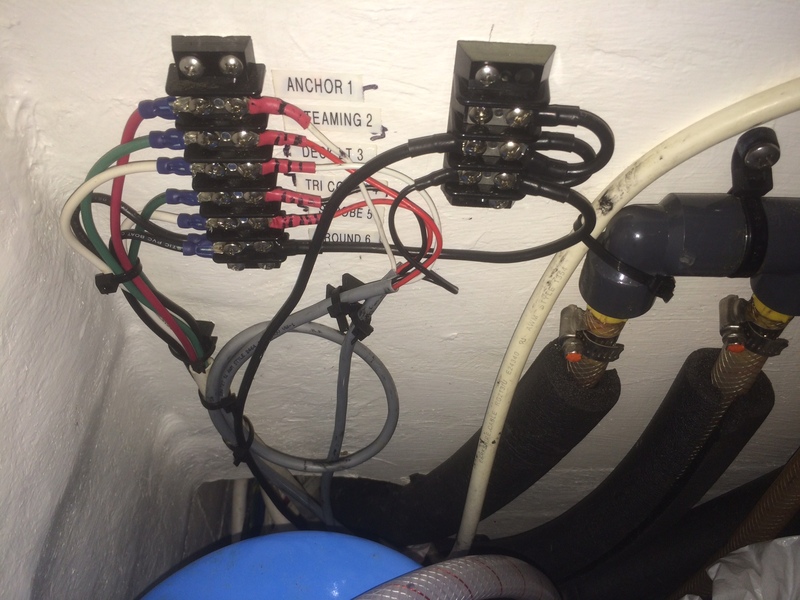 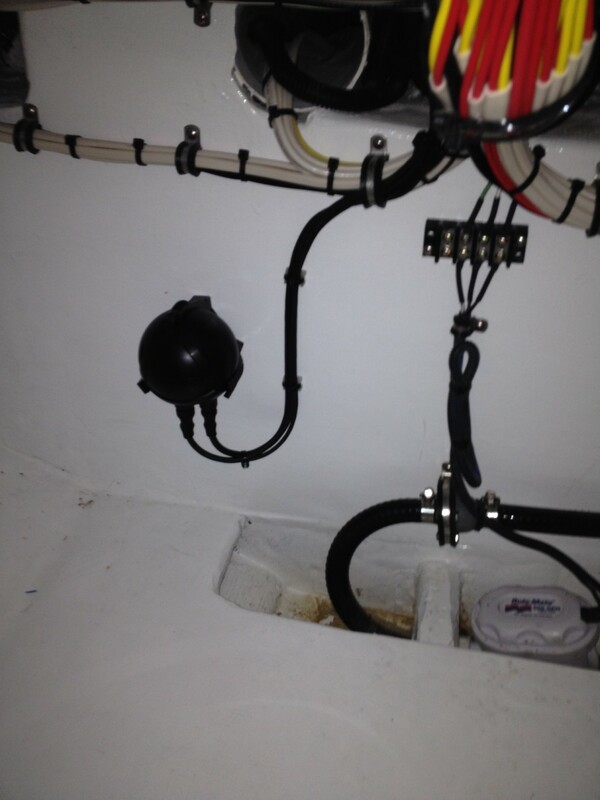 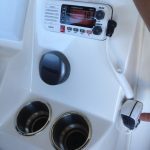 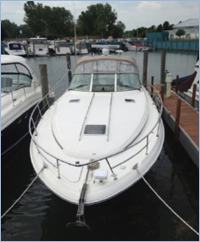 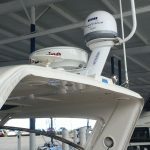 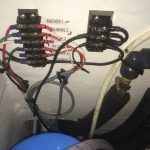 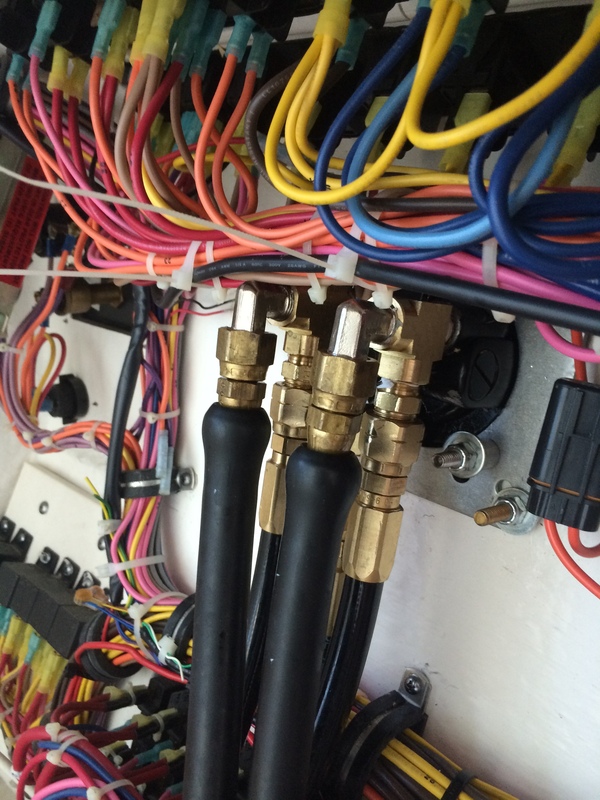 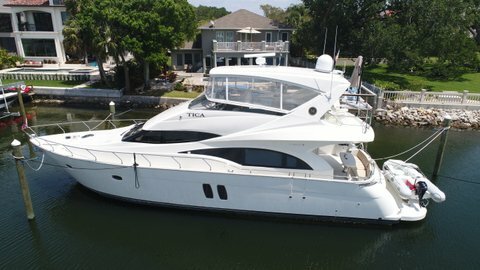 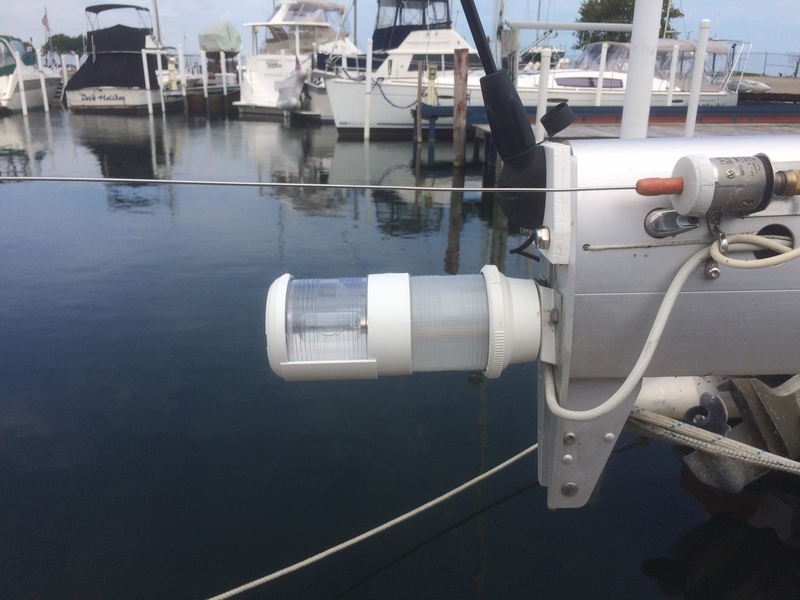 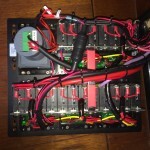 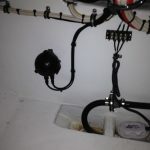 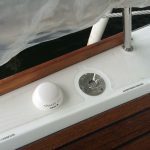 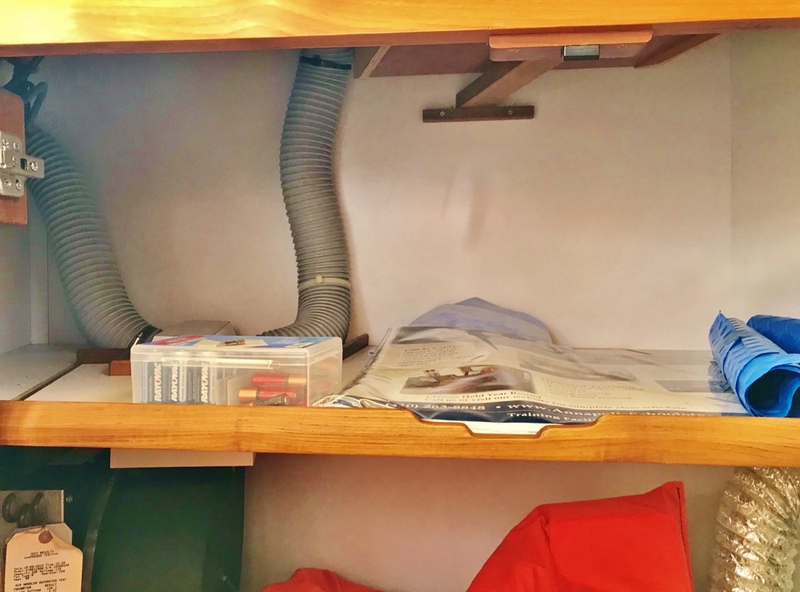 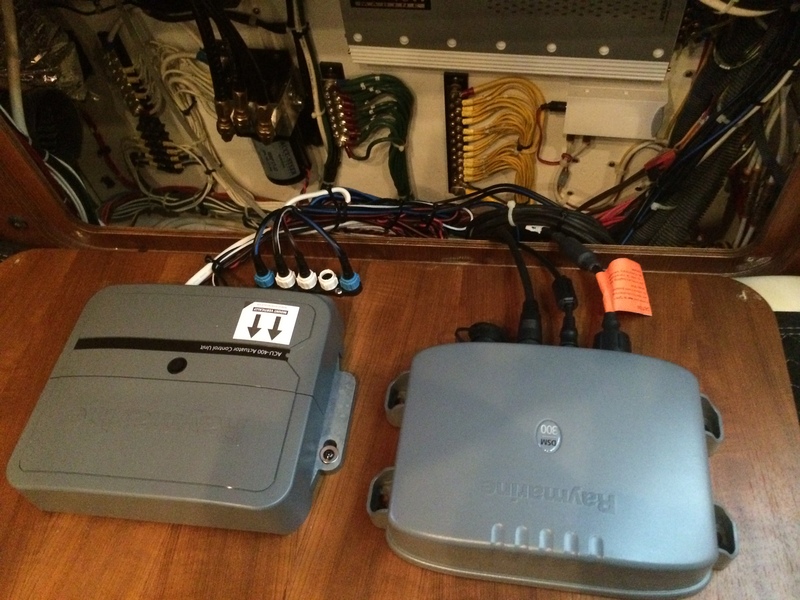 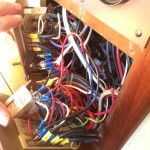 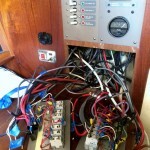 This 30 year old boat has another 30 years of safe, reliable electrical protection as well as a whole updated new look! 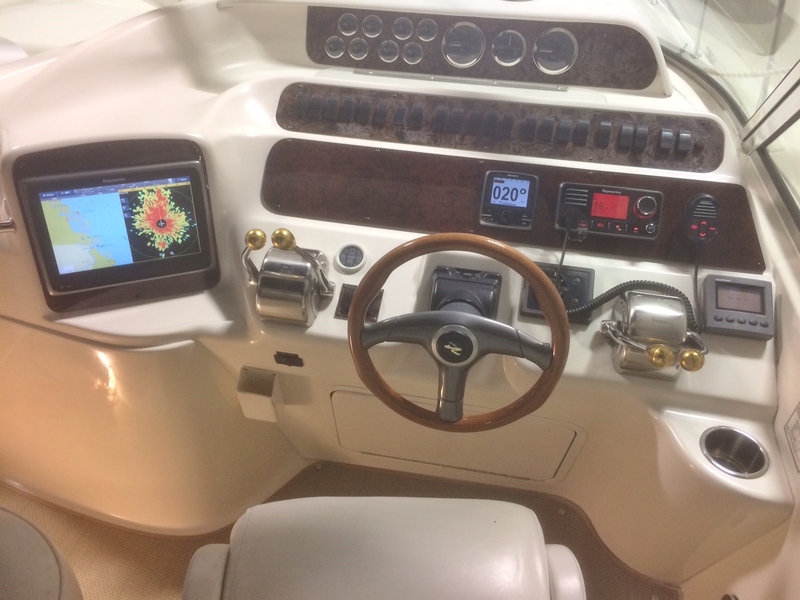 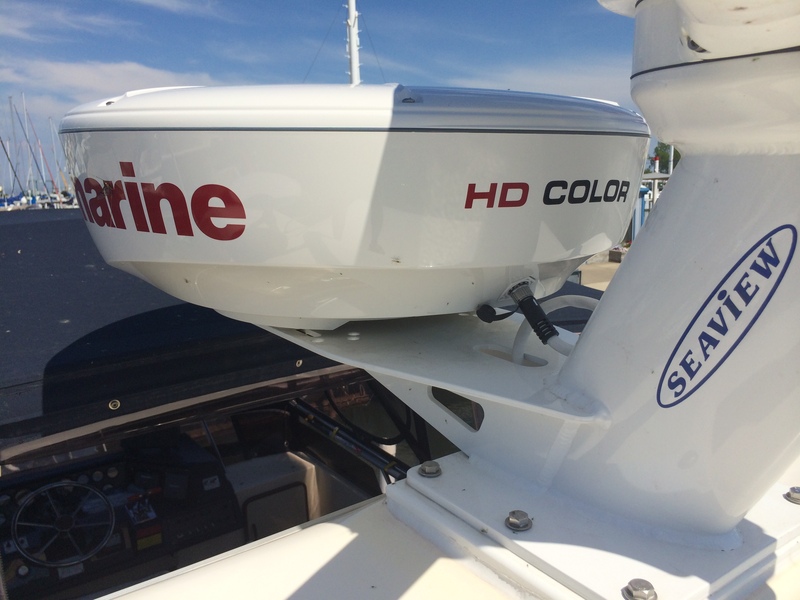 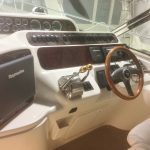 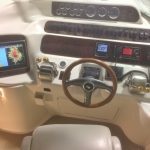 We upgraded this Searay with TWO new 12″ Raymarine e-Series Plotter/Sounder and a new 48″ Super HD Color Radar as well as a completely new Fusion Stereo System, ICOM VHF/Loudhailer and a 3-Stage Mastervolt Battery Charger. 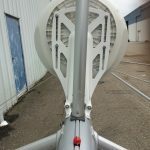 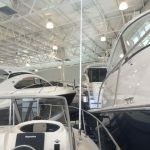 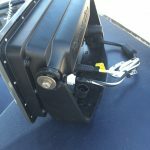 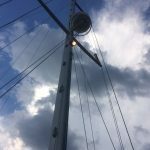 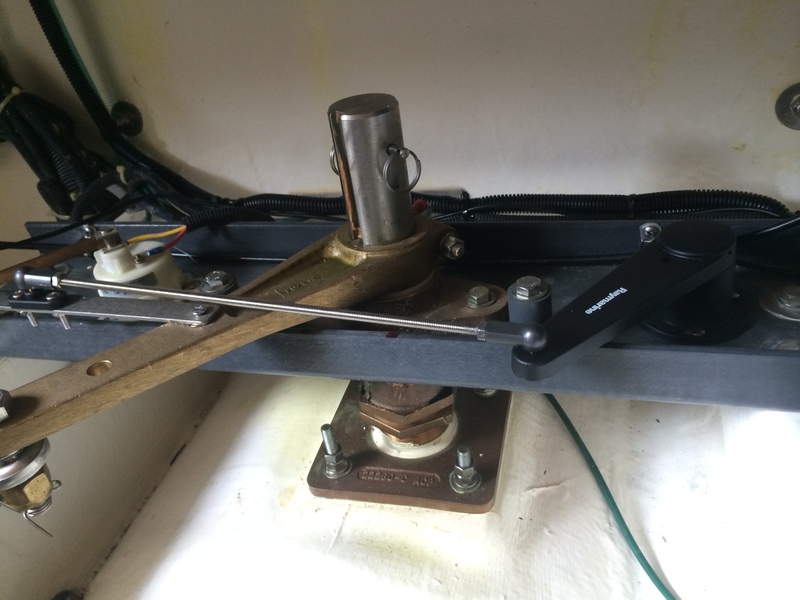 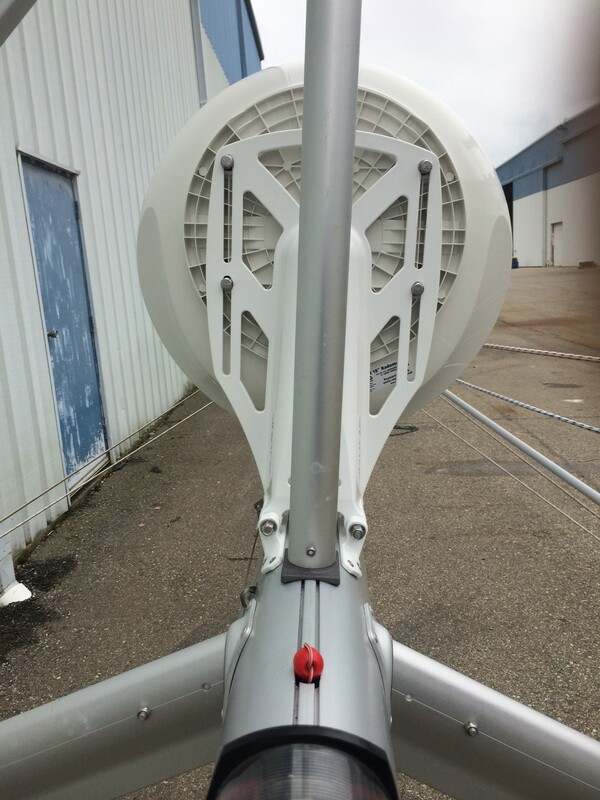 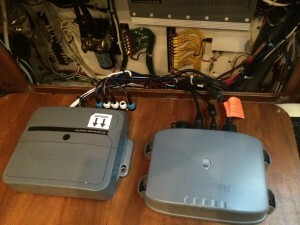 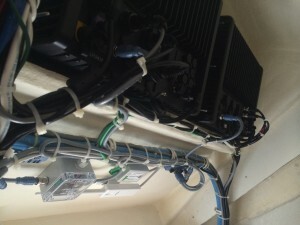 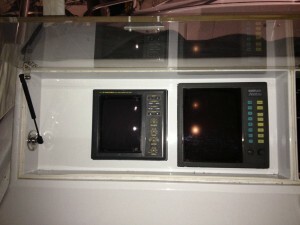 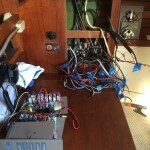 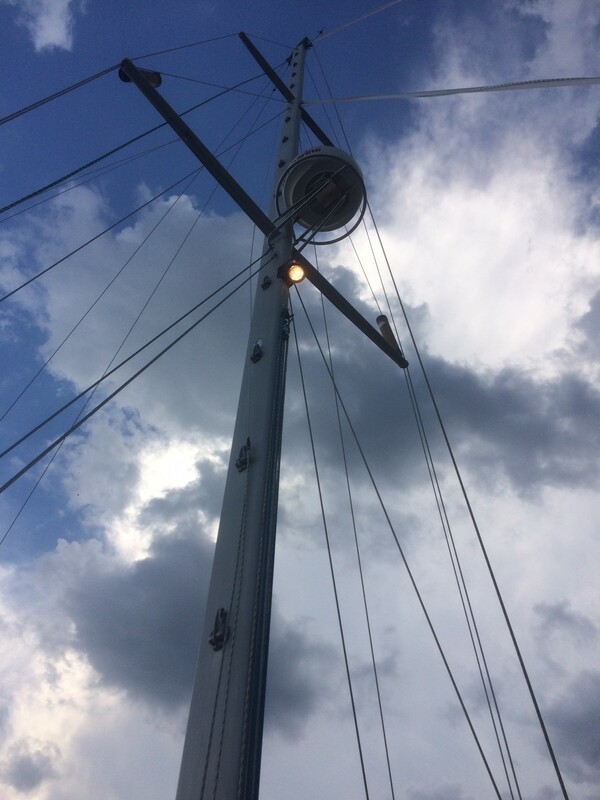 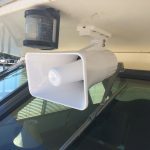 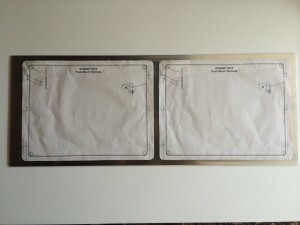 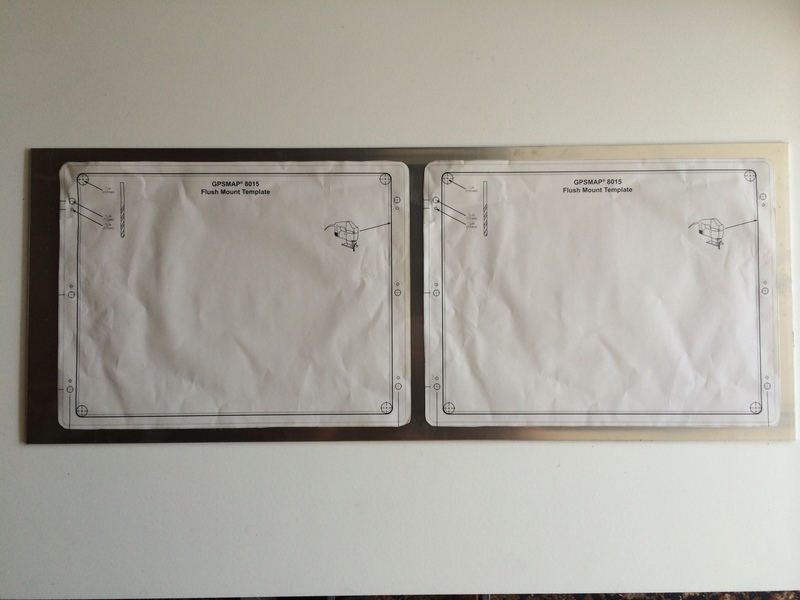 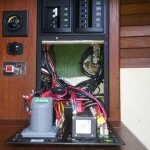 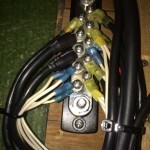 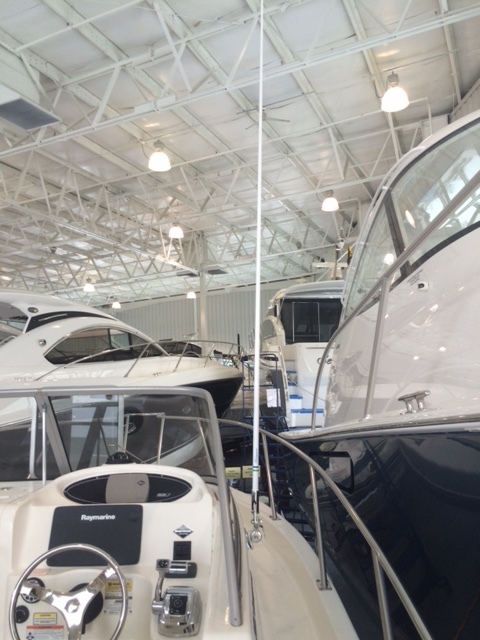 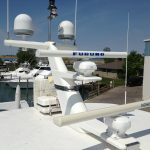 Reinstall all mast/stinger electronics (satellite domes, antennas, speakers, lights, etc.) 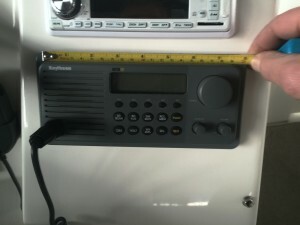 for newly cut mast which wouldn’t fit in the warehouse without losing 8 feet of overall height. 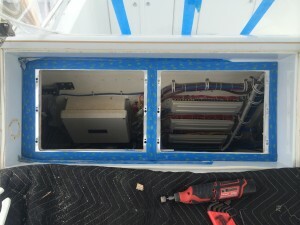 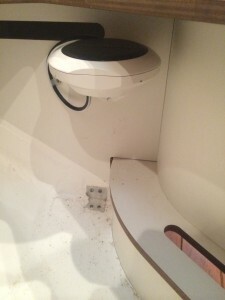 Also installed new quick disconnects for next fall when the process has to happen all over again. 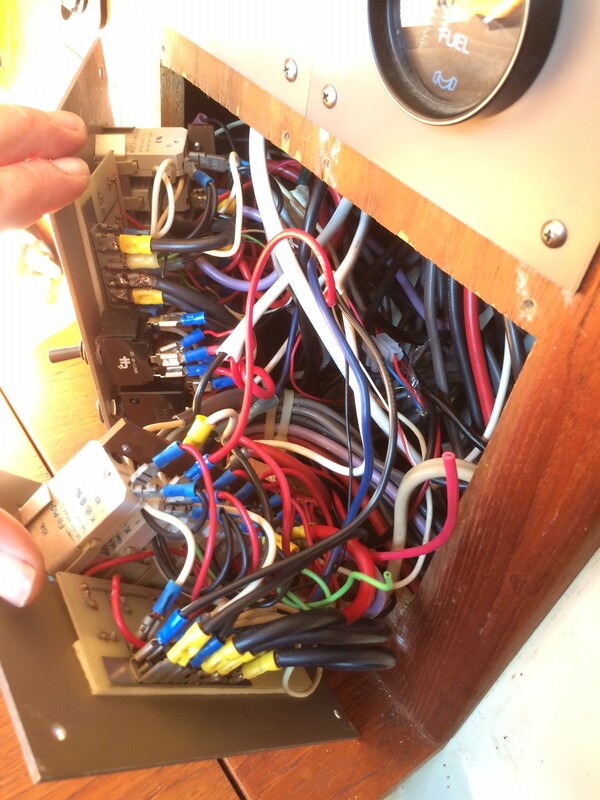 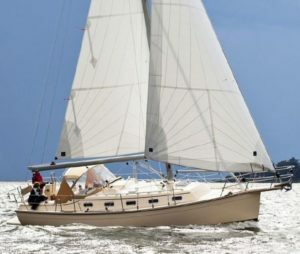 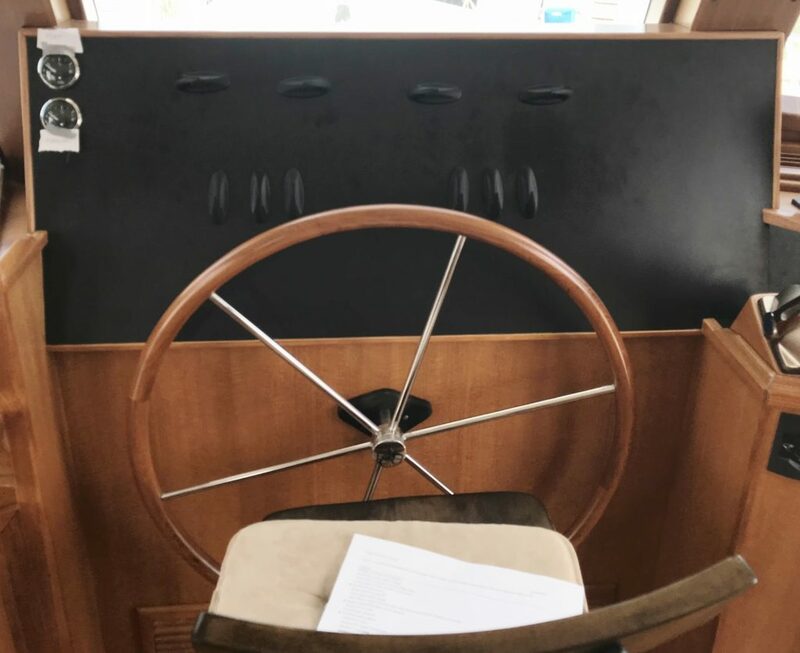 This older sailboat was in desperate need of some new overall Navigation, Instrumentation, Communications and Autopilot. 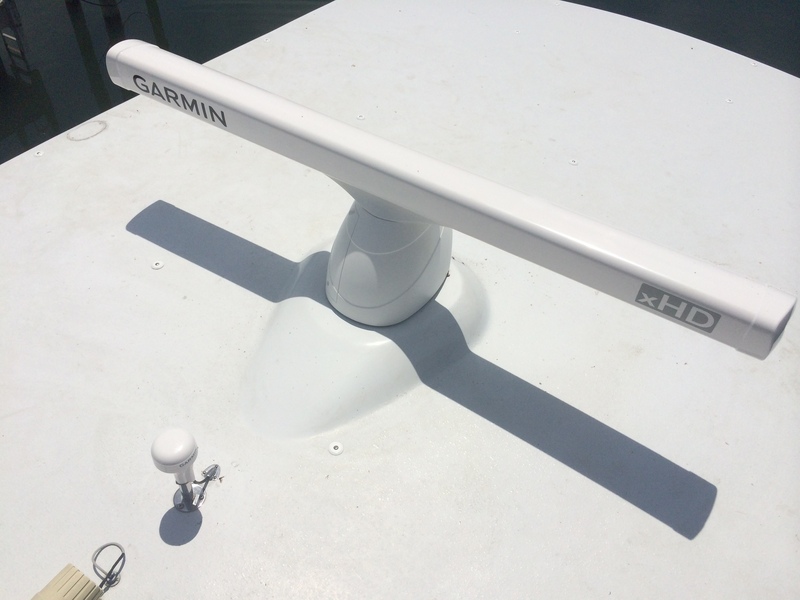 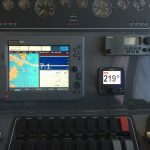 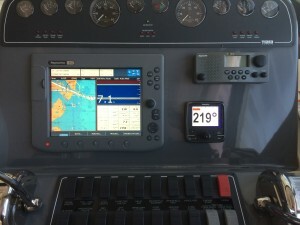 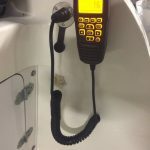 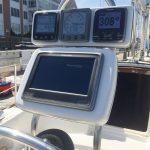 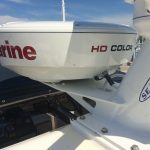 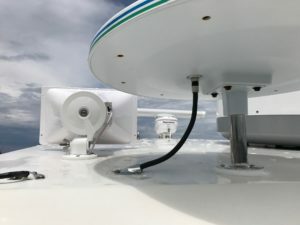 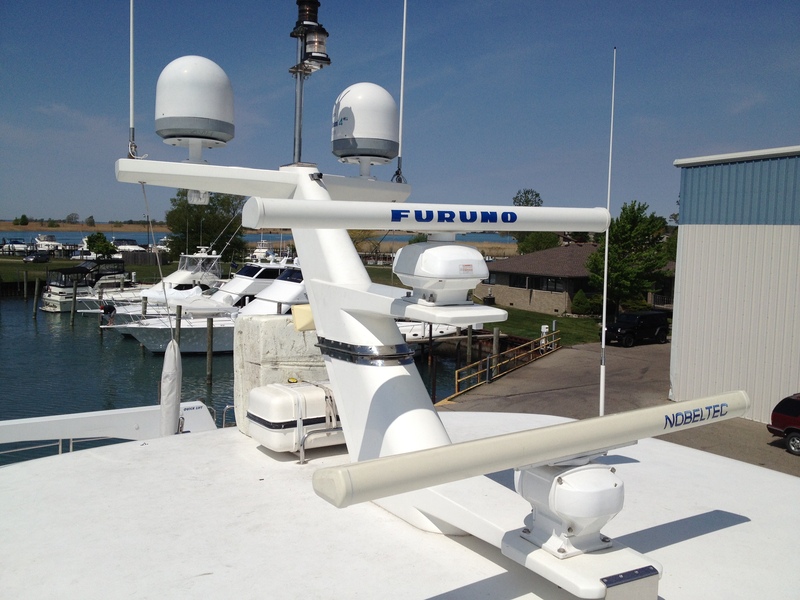 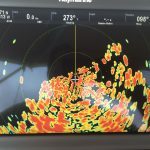 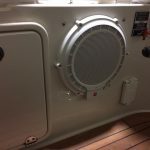 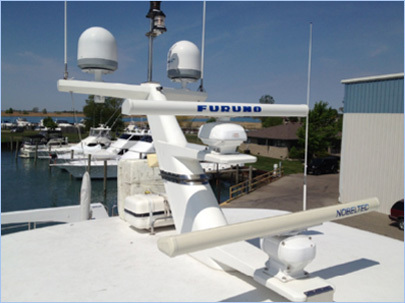 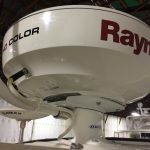 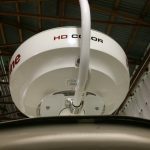 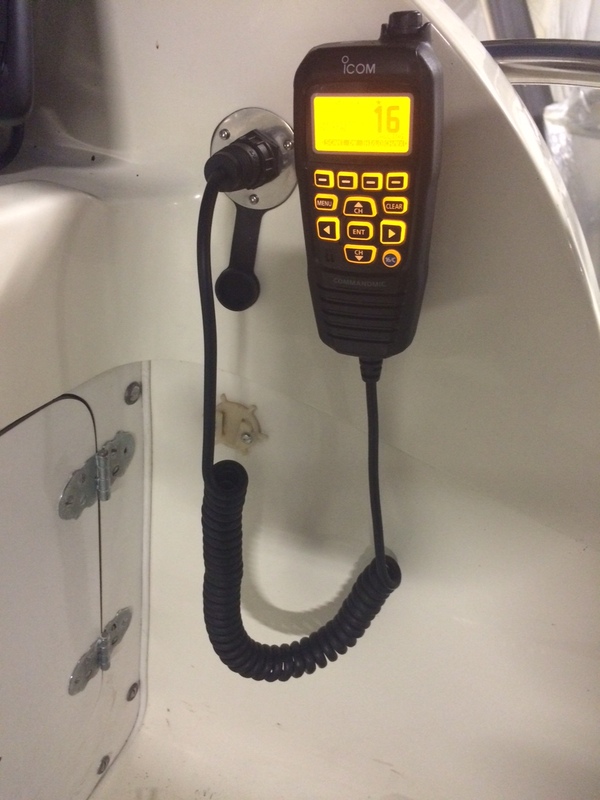 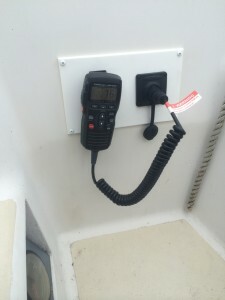 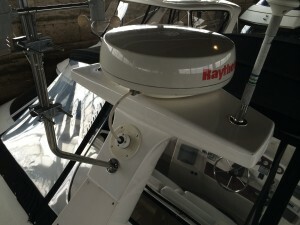 We removed the outdated Signet Wind and Raytheon Depth and cleaned up the instrument pods as well as adding the latest Raymarine a75 Touchscreen multidisplay in its own pod, new Wheelpilot, i70 Instrument for wind,depth & speed, all new mast wiring and lighting and a new Standard Horizon VHF with AIS and built in GPS. 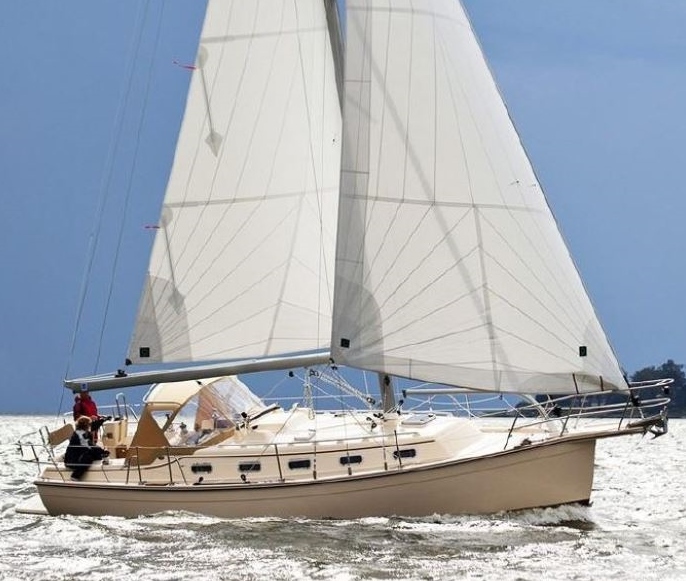 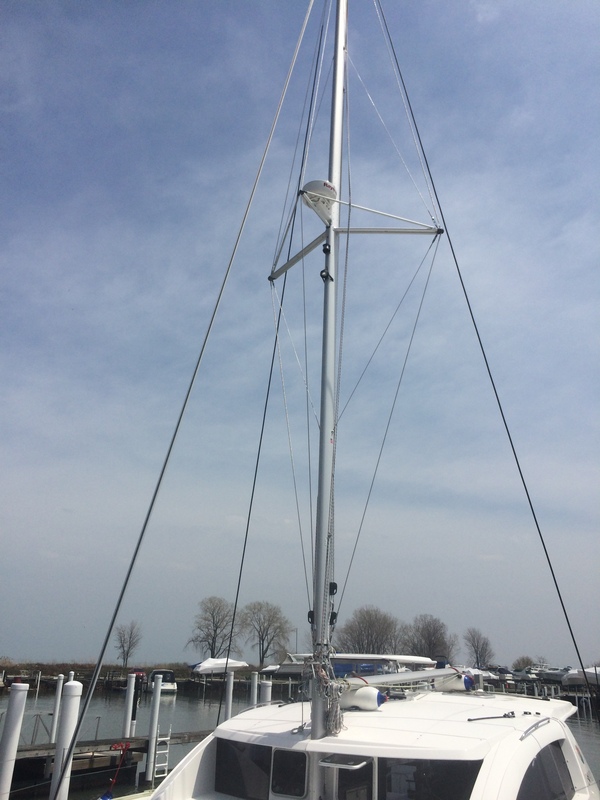 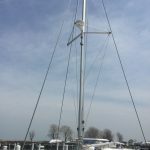 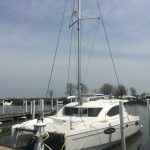 This boat is now ready for anything and has new life giving a whole new sailing experience to these owners! 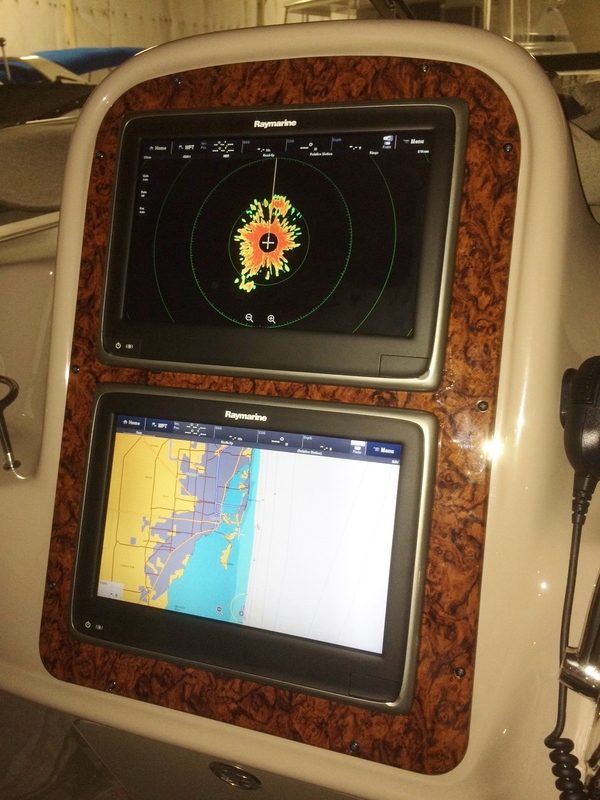 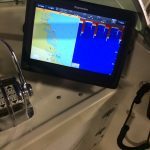 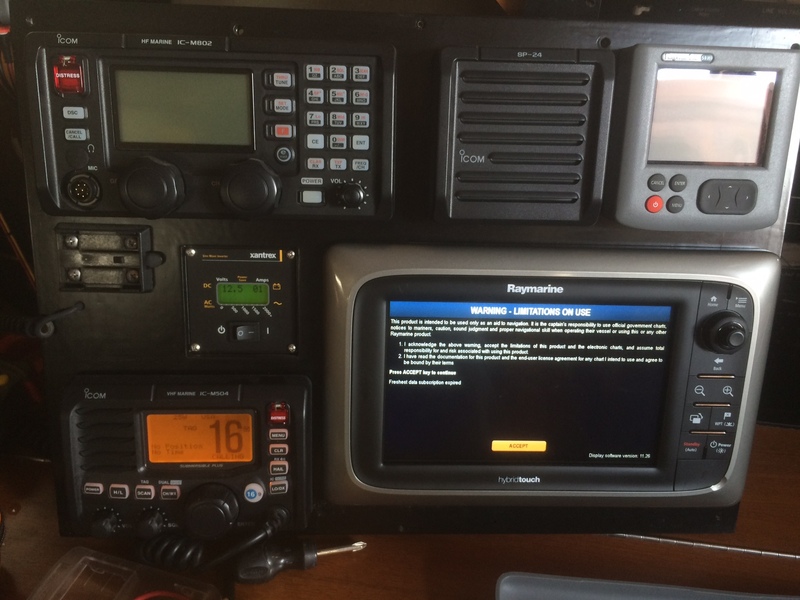 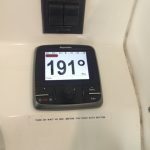 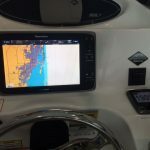 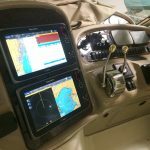 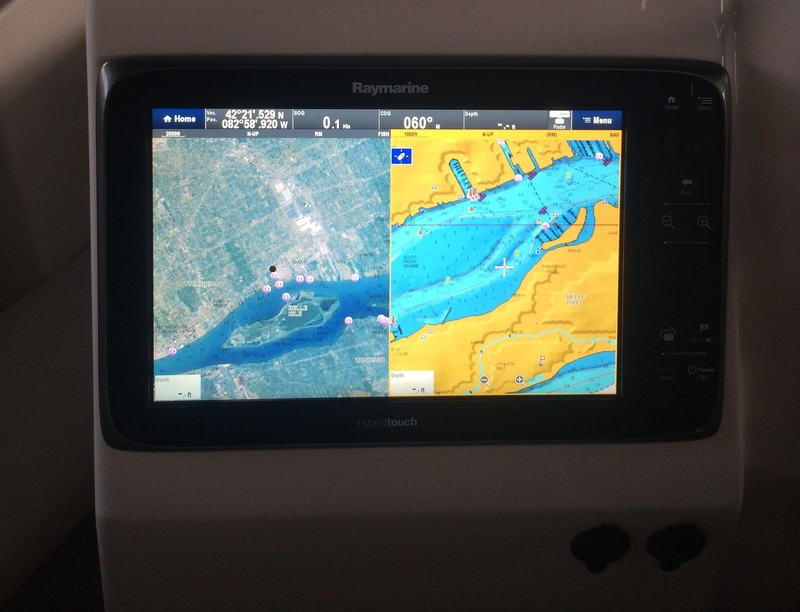 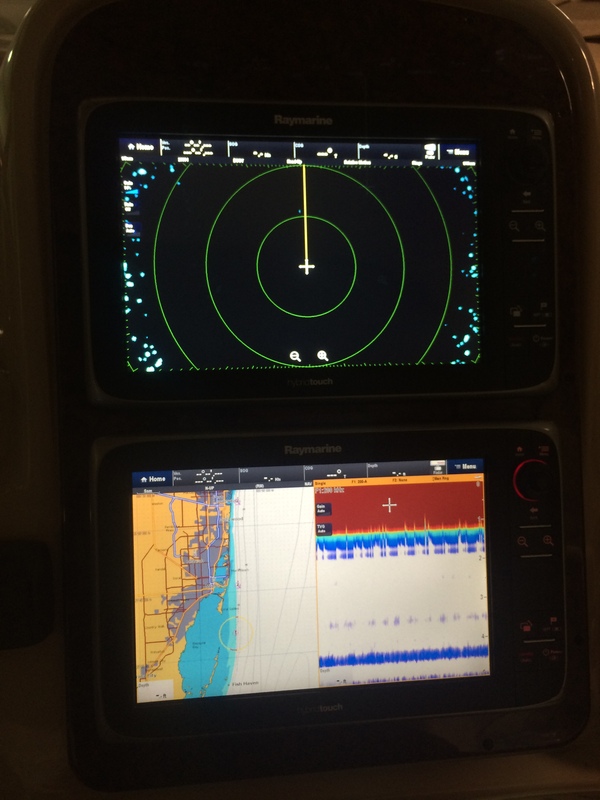 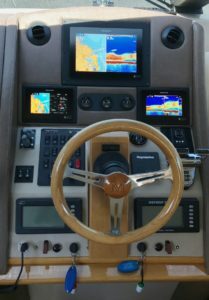 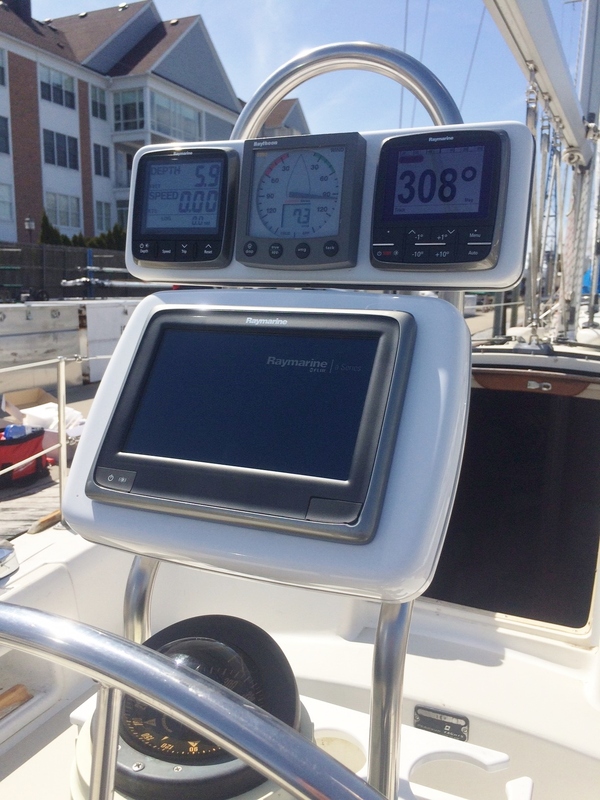 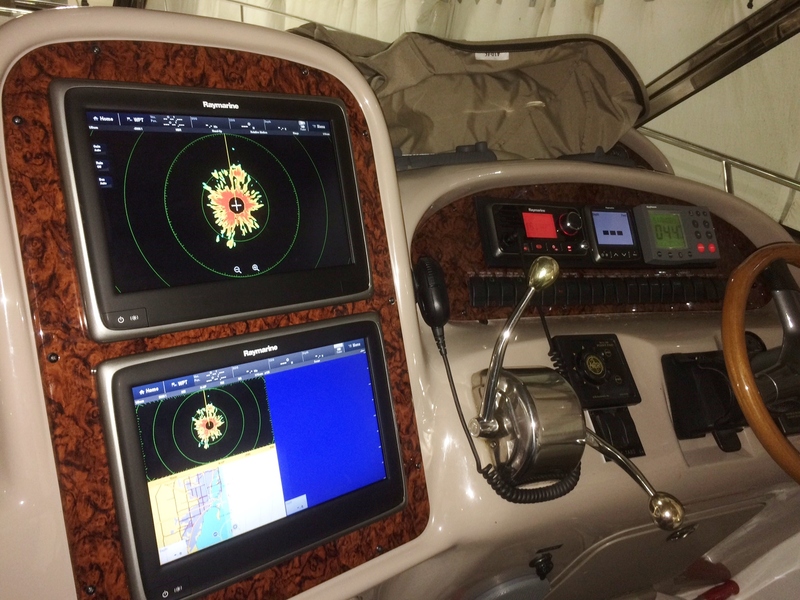 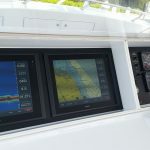 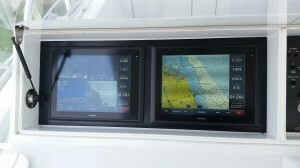 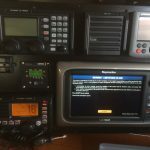 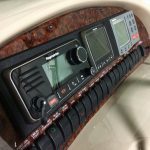 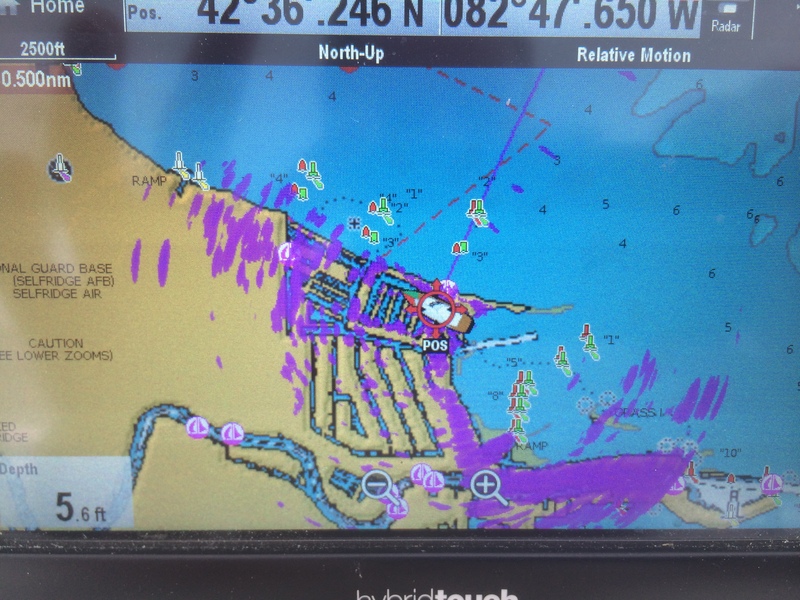 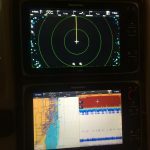 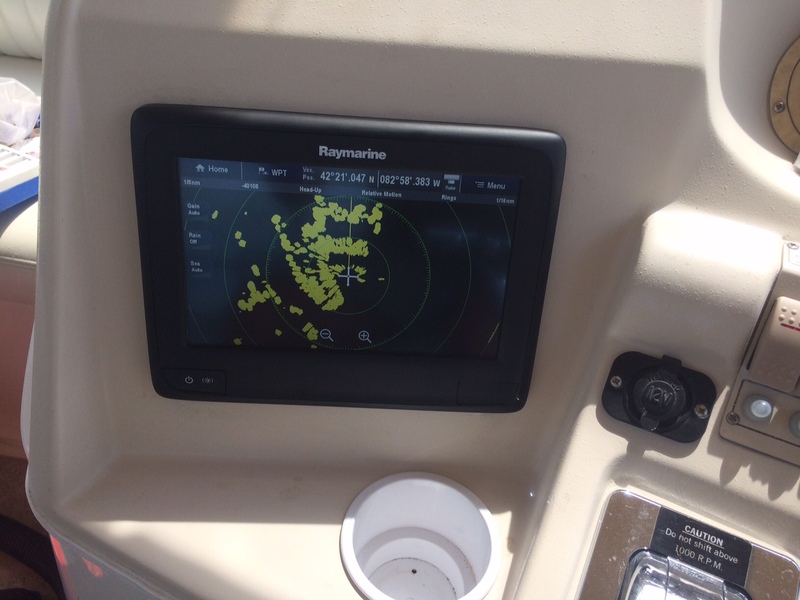 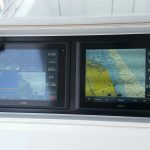 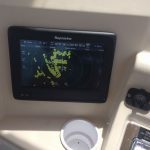 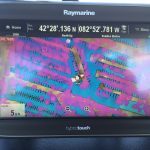 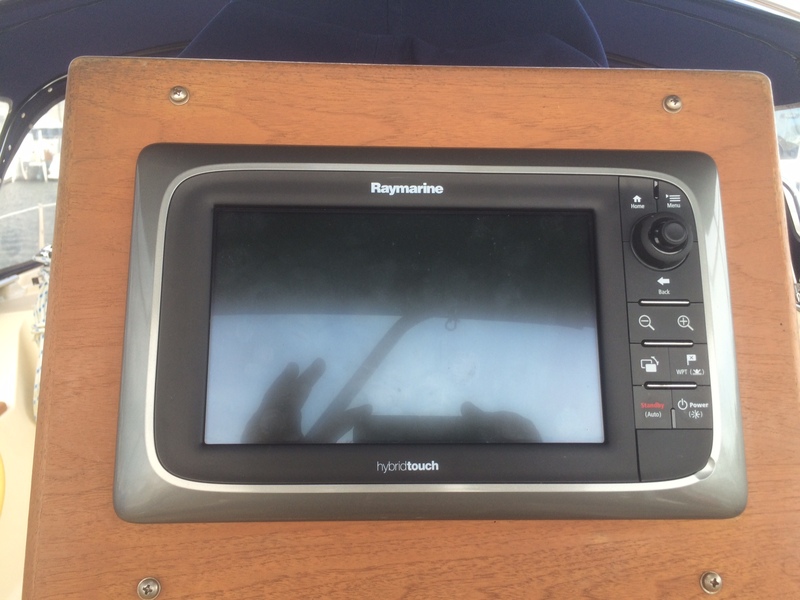 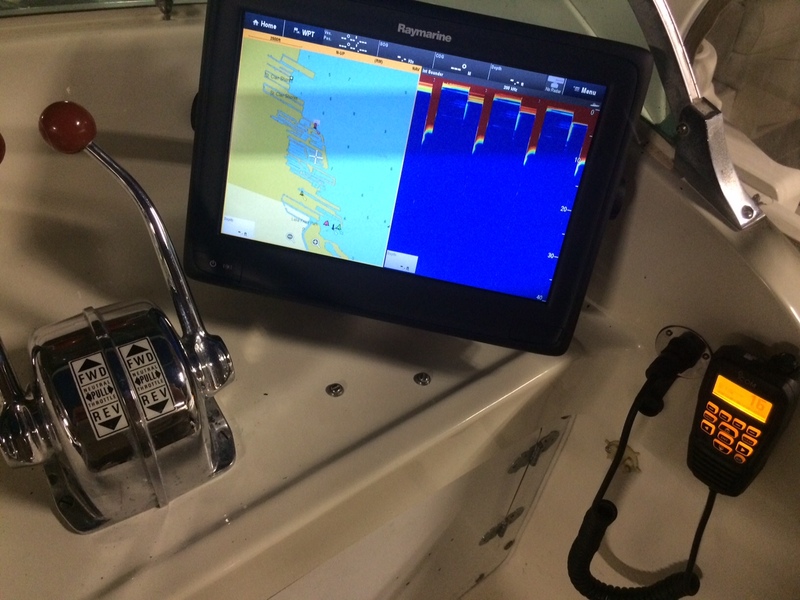 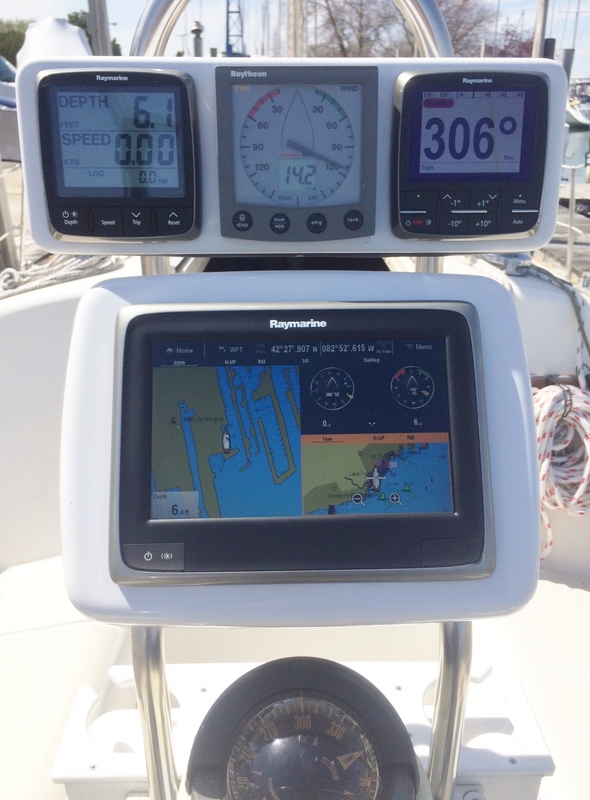 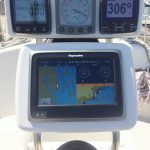 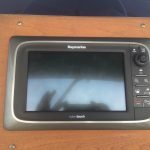 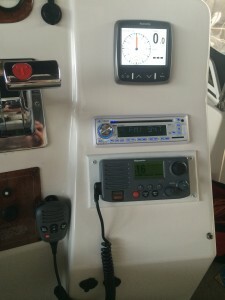 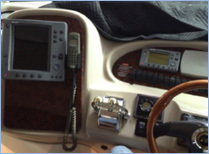 Due to the limited size available to flush mount a multifunction display, we added a 9″ Raymarine e95 Touchscreen GPS/Plotter to use in addition to the existing 7″ C70 Multidisplay which will now primarily serve as a stand alone radar and backup GPS. 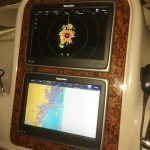 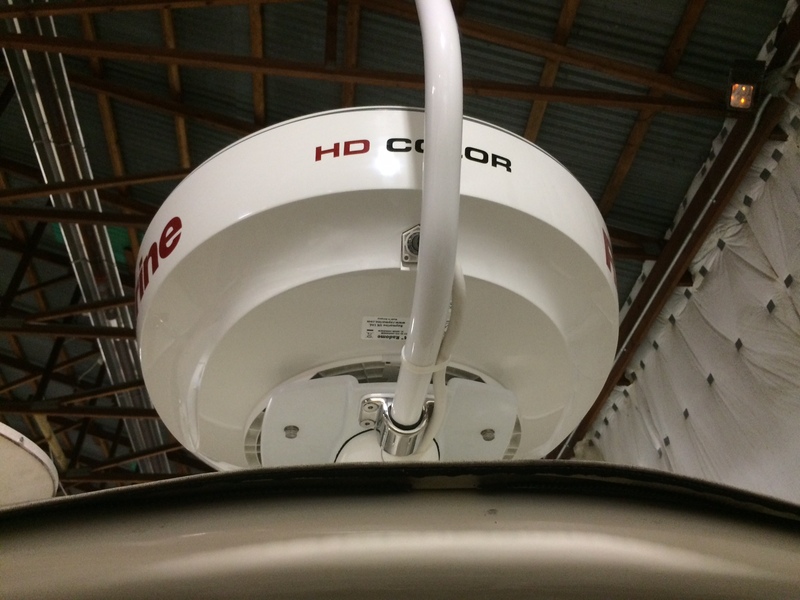 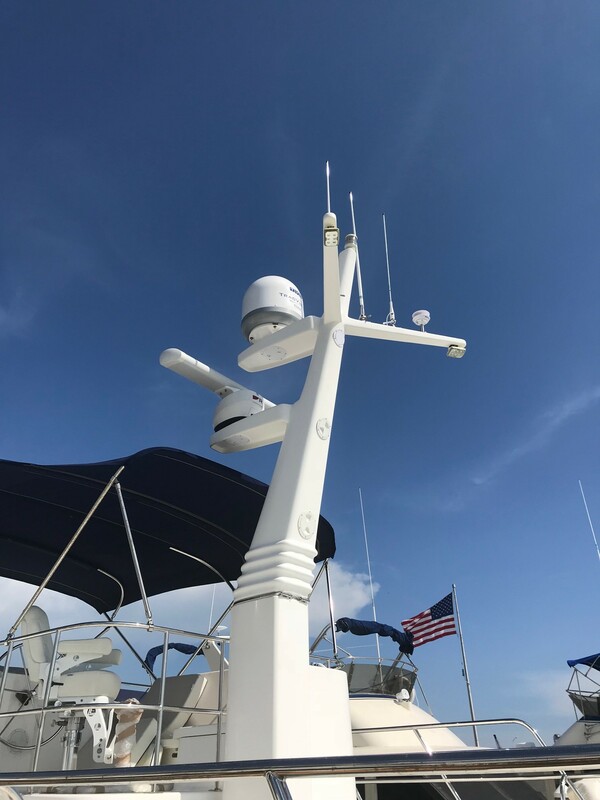 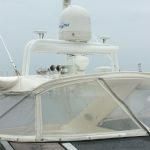 This customer was ready to upgrade his original Raytheon 24″ Radar Dome, Chartplotter, Instrument and VHF with a new larger 48″ Open Array HD Color Radar, 12″ e125 Chartplotter, i70 Instrument and Ray55 VHF as well as a new local HD TV Over-the-Air Antenna. 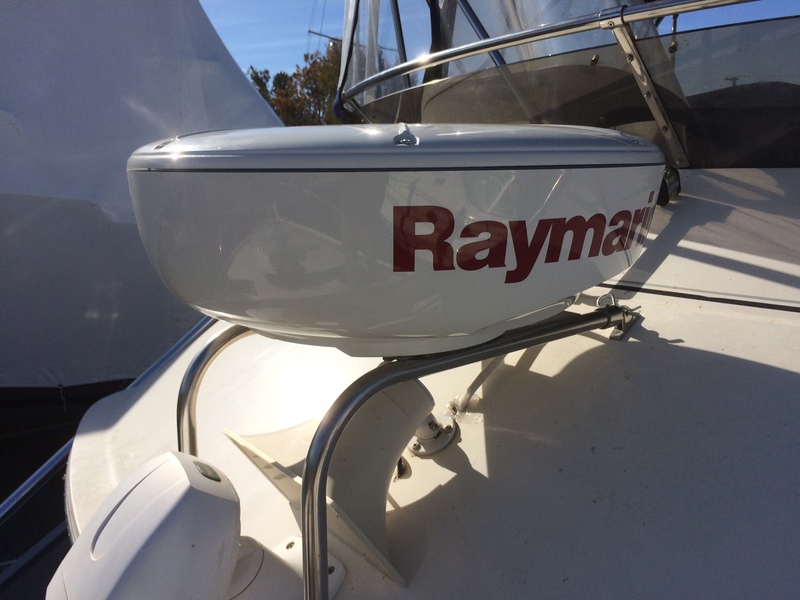 Now he’s ready for another 15 years of safe and happy boating! 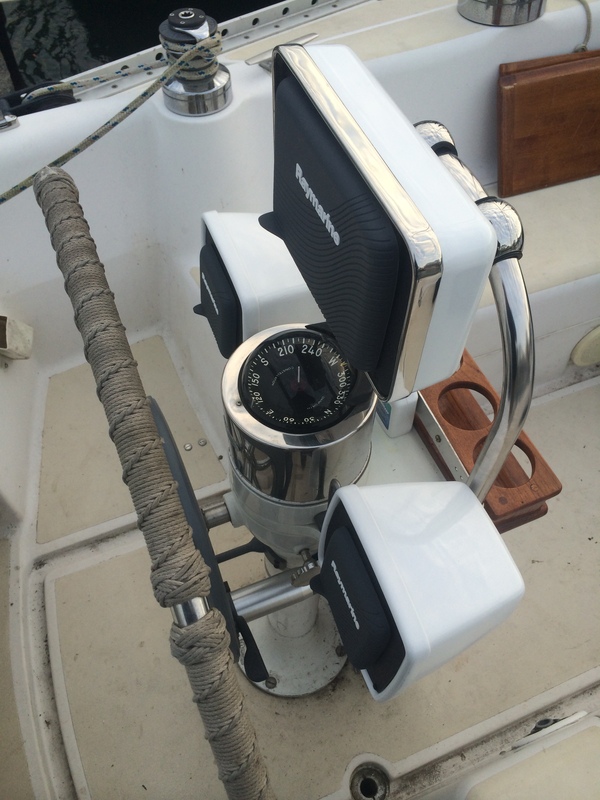 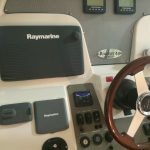 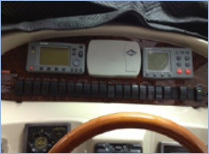 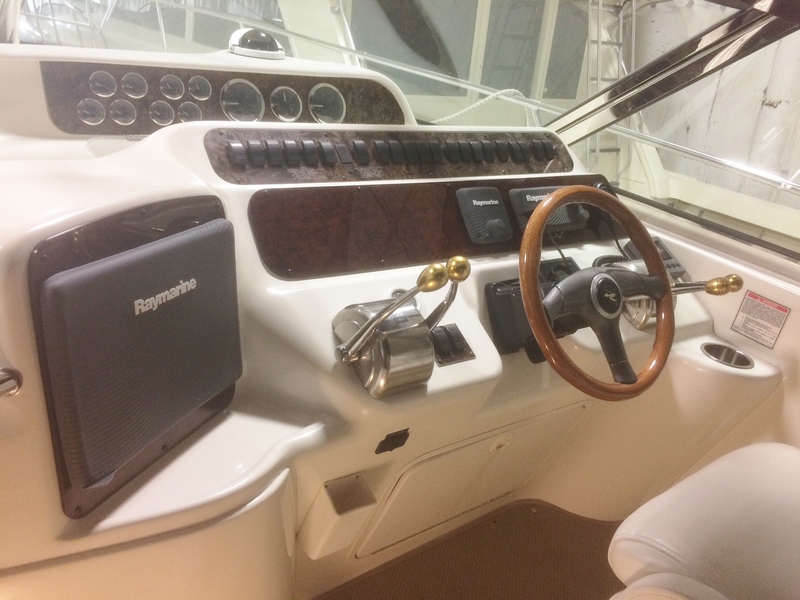 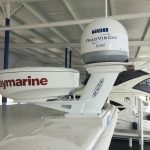 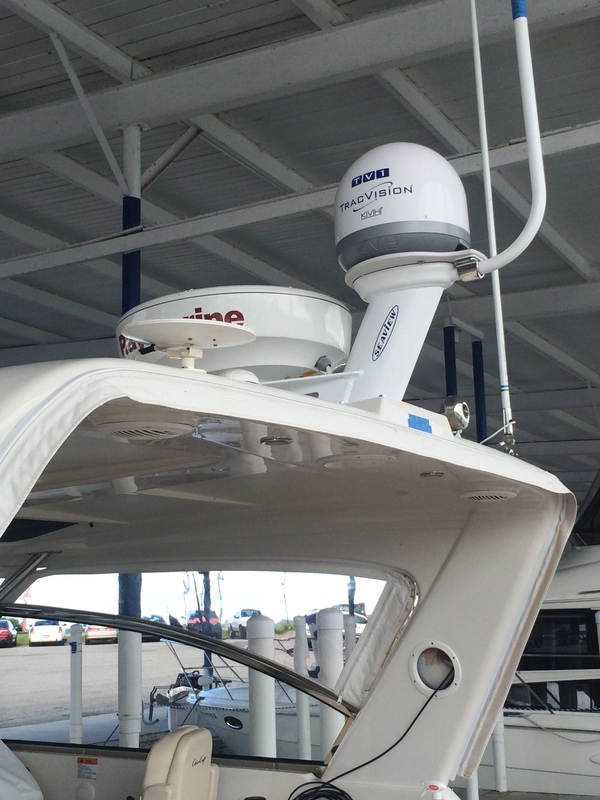 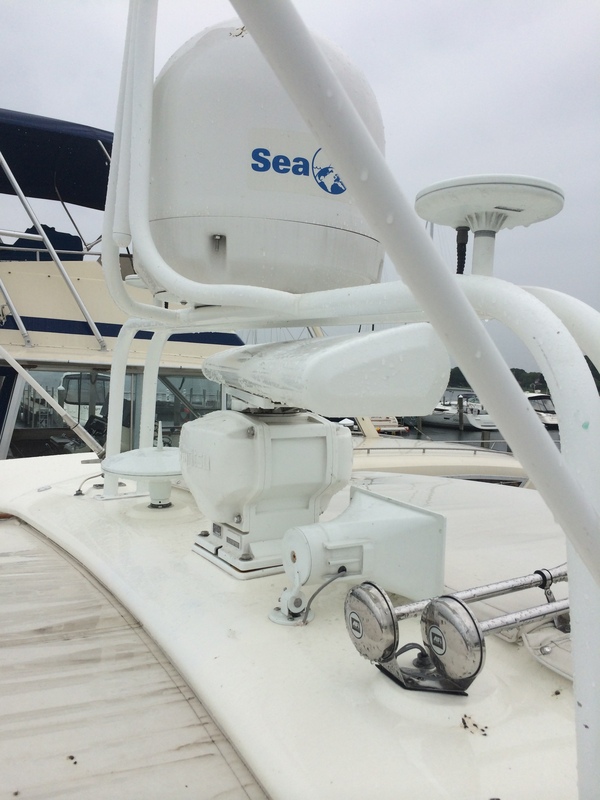 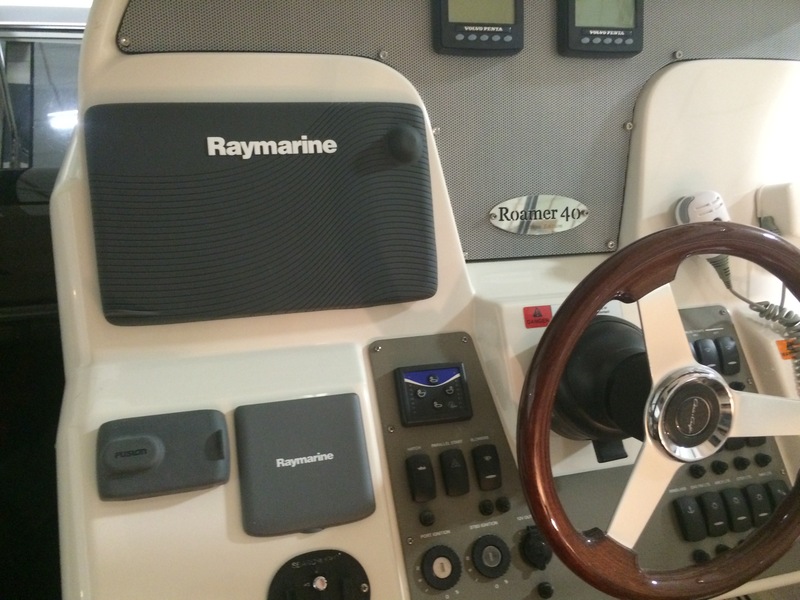 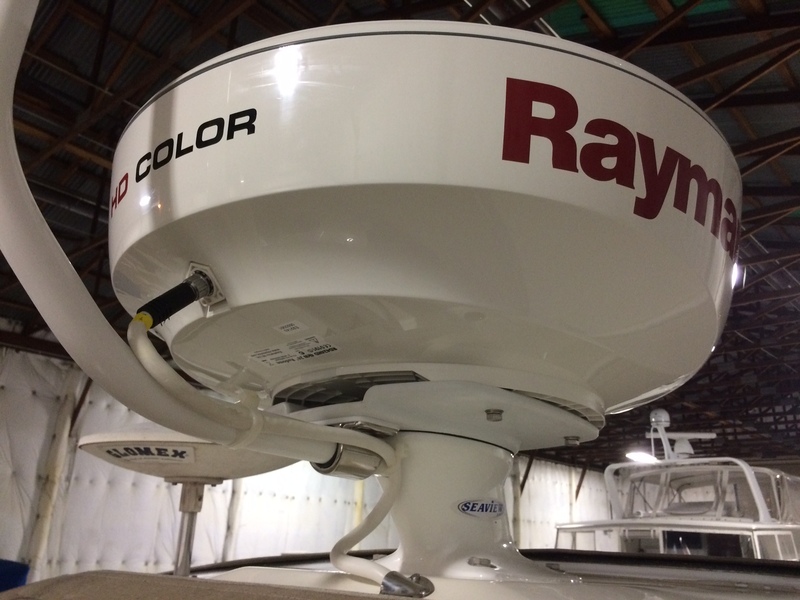 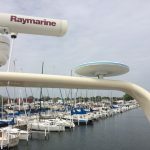 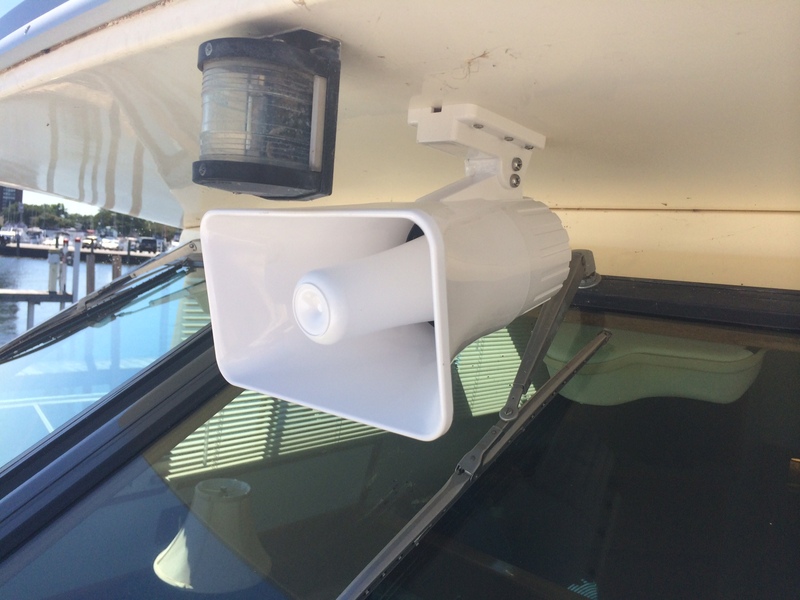 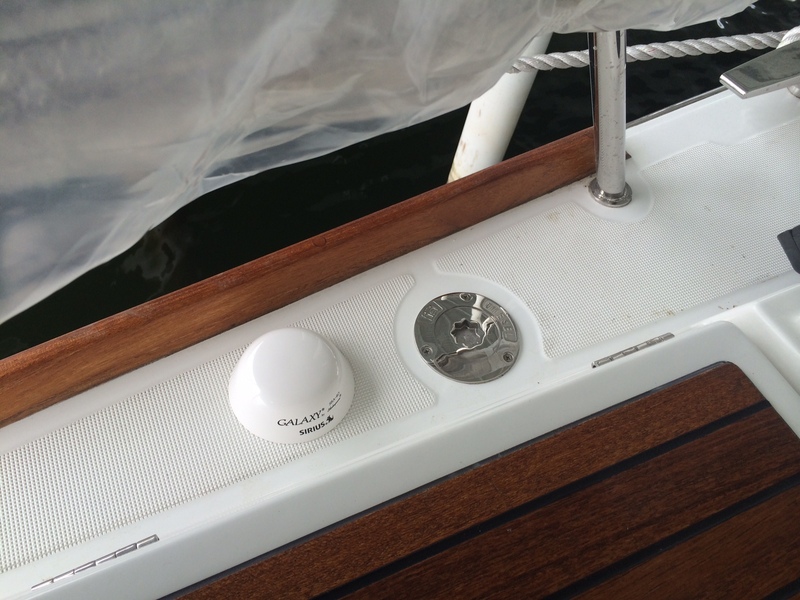 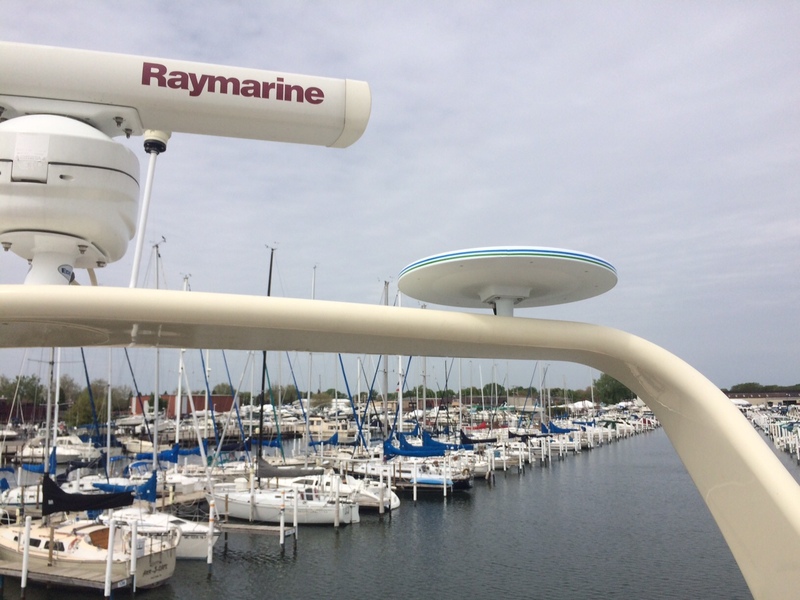 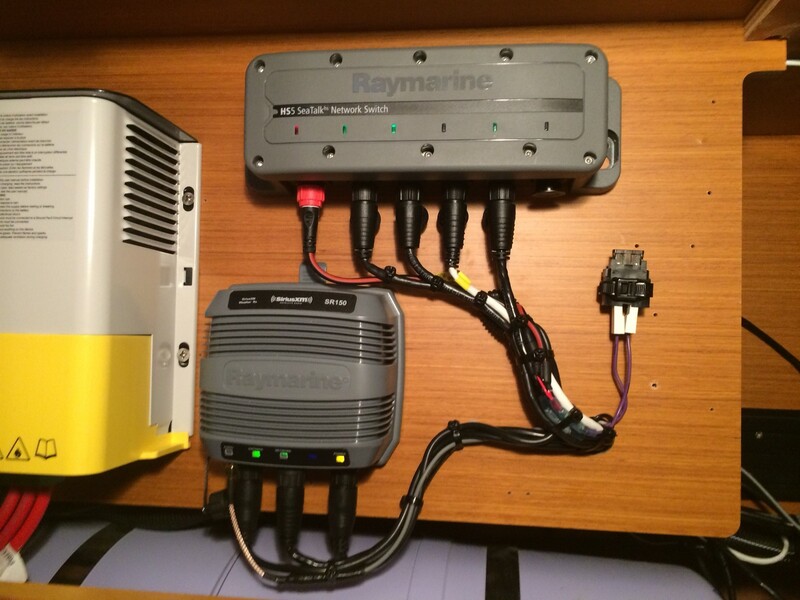 After solving some troubleshooting issues with this customer’s Raymarine C120 and Clarion Stereo System, he decided it was time for an Autopilot which we were happy to handle. 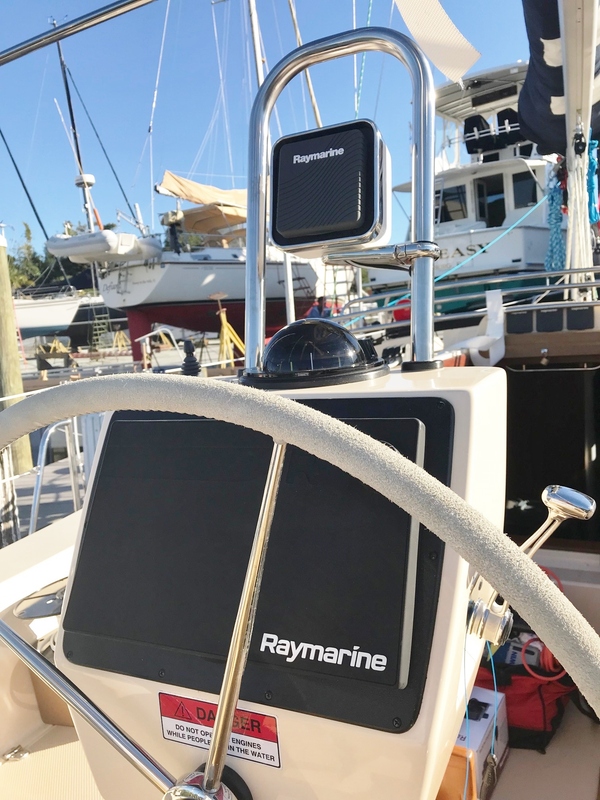 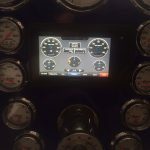 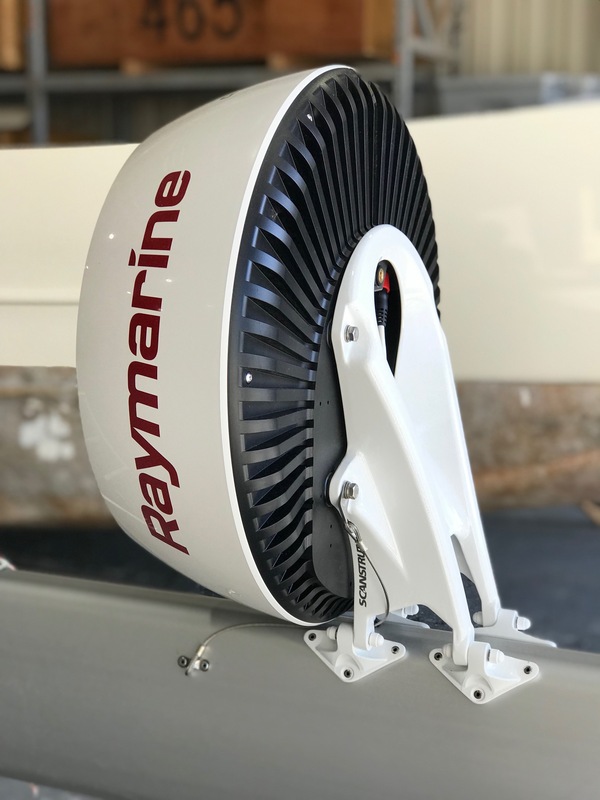 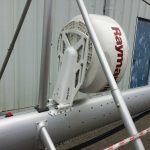 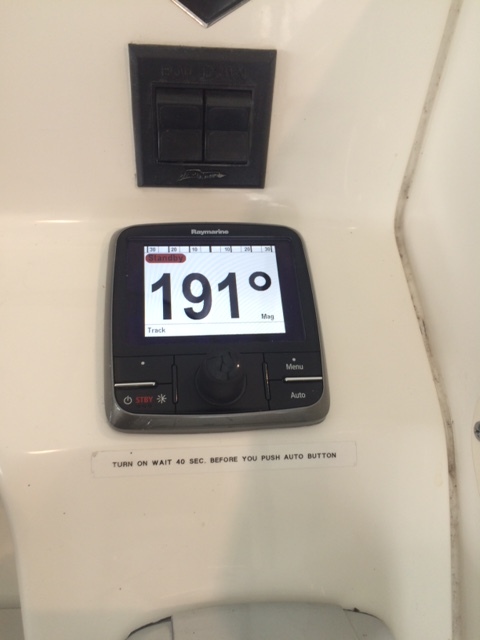 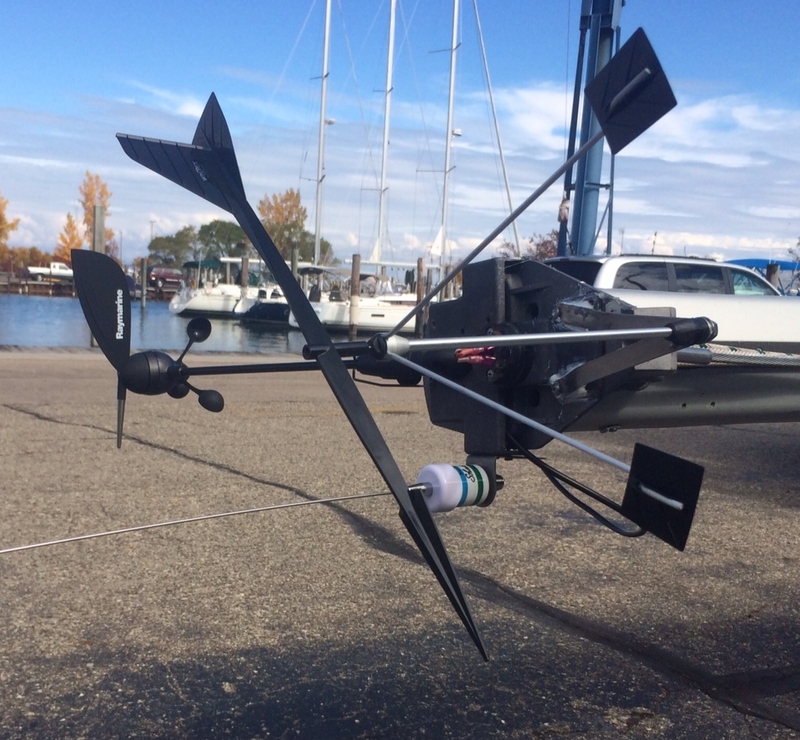 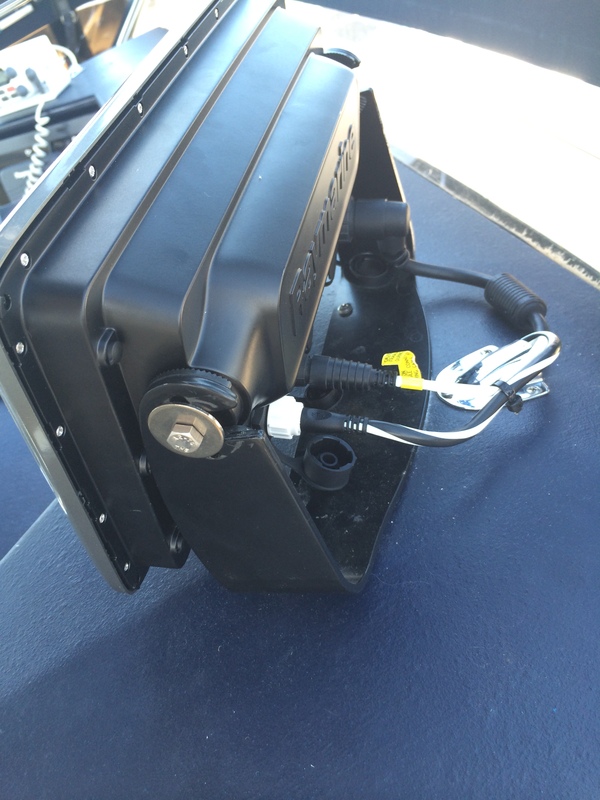 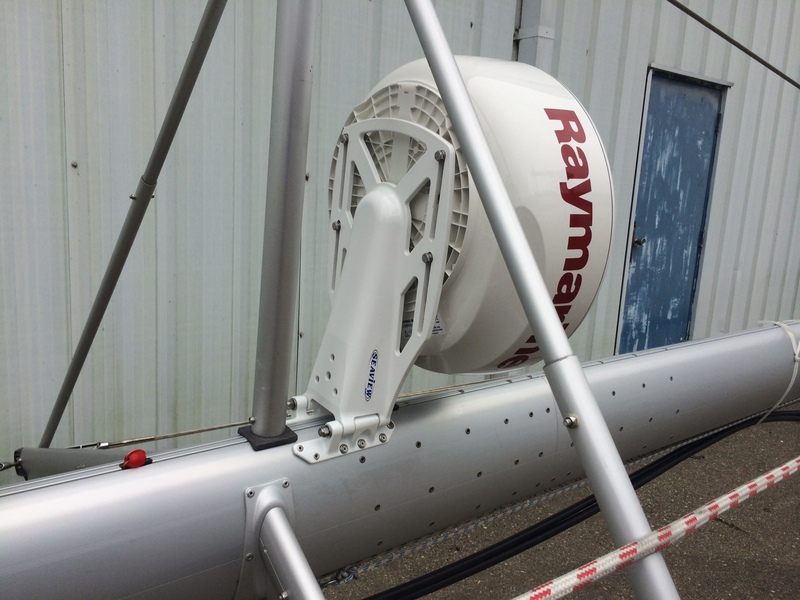 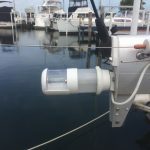 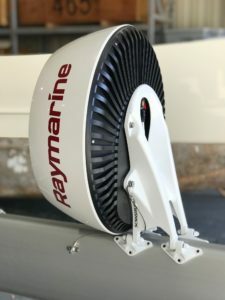 This is the latest EVOLUTION Autopilot by Raymarine using state of the art gyro accelerometers for unsurpassed performance in any sea state.